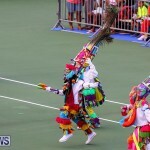 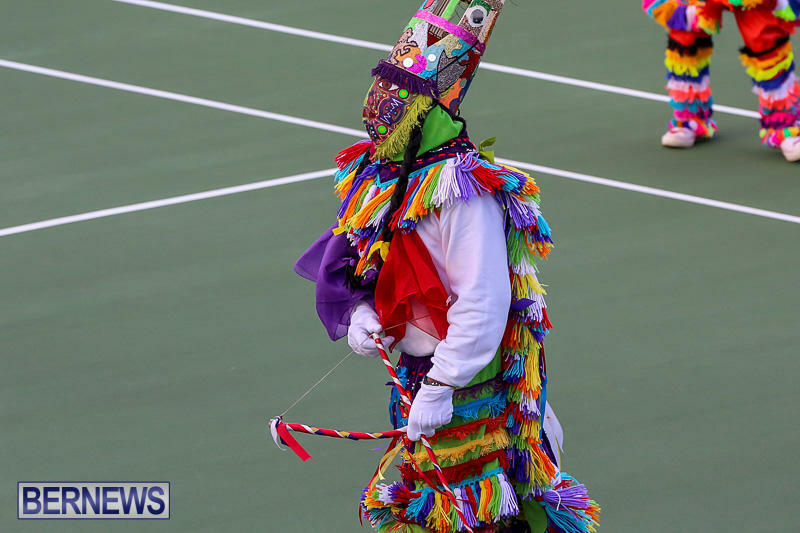 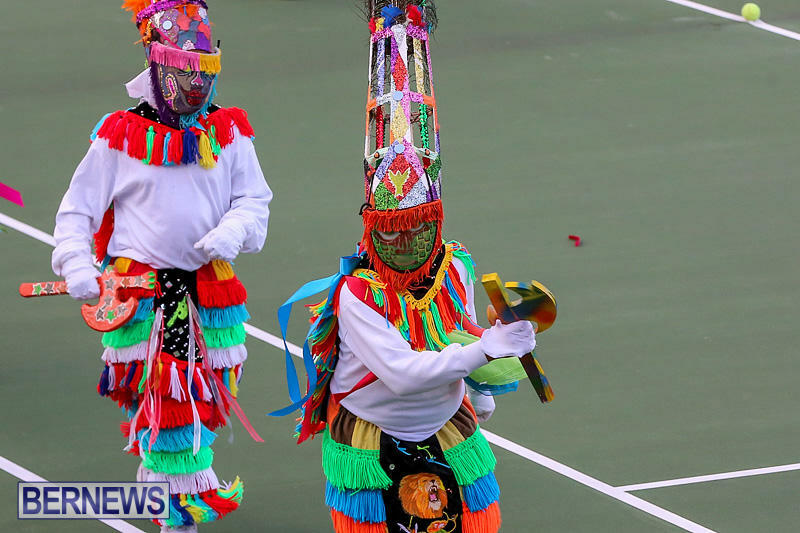 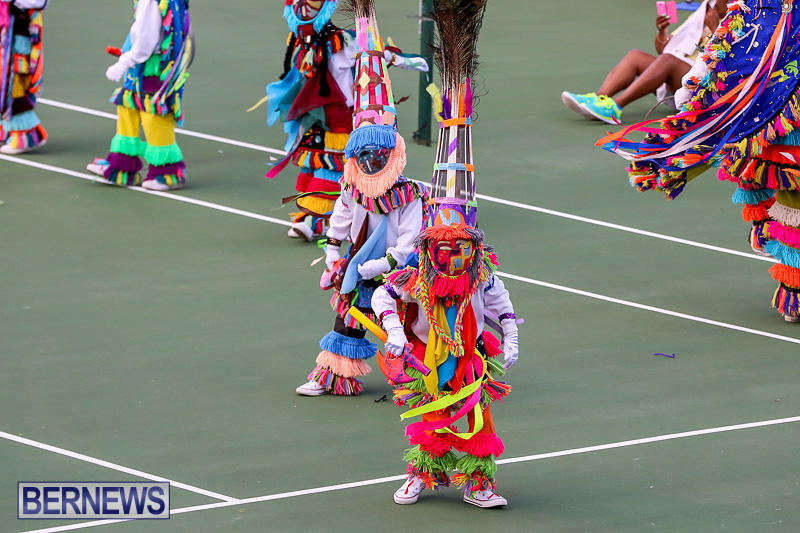 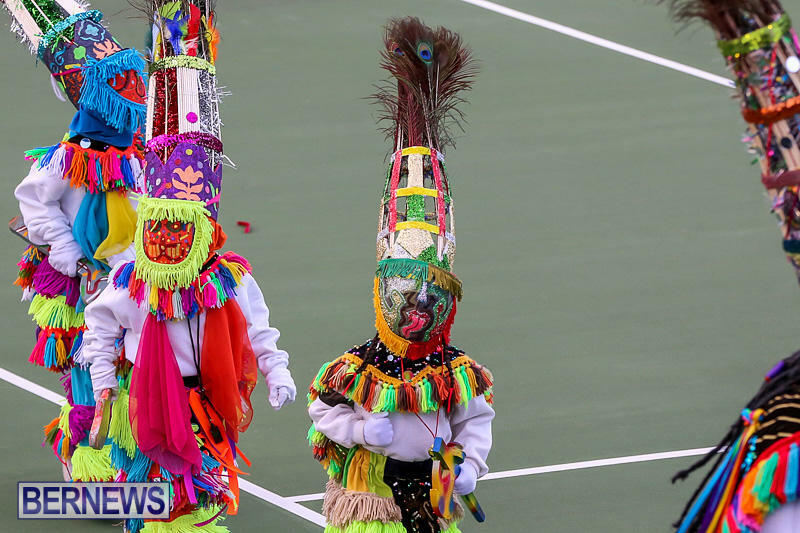 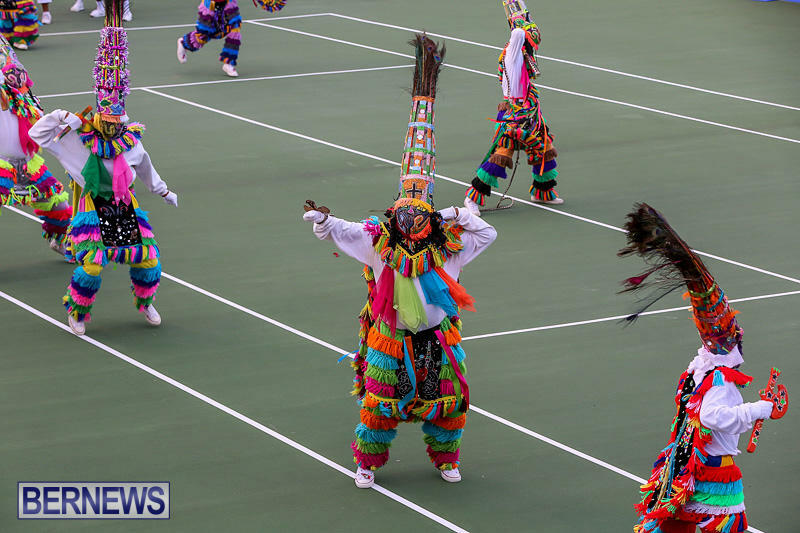 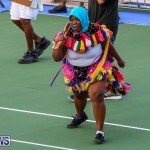 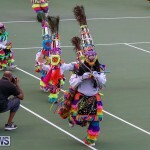 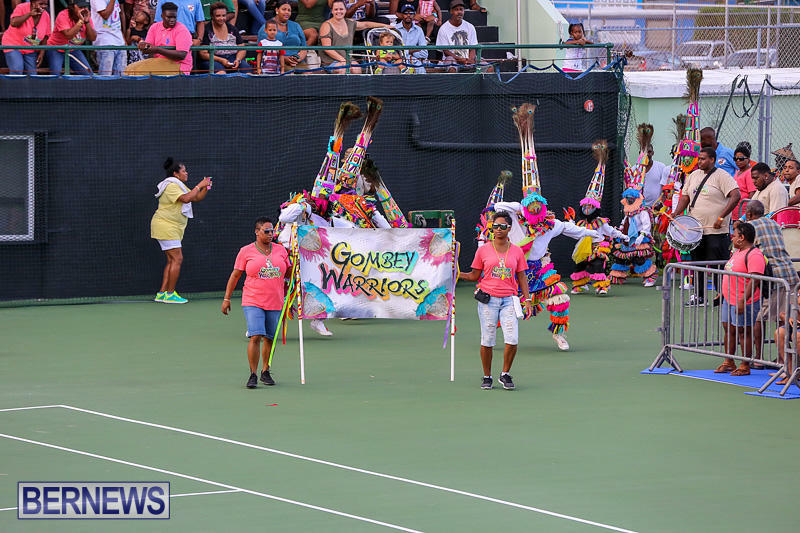 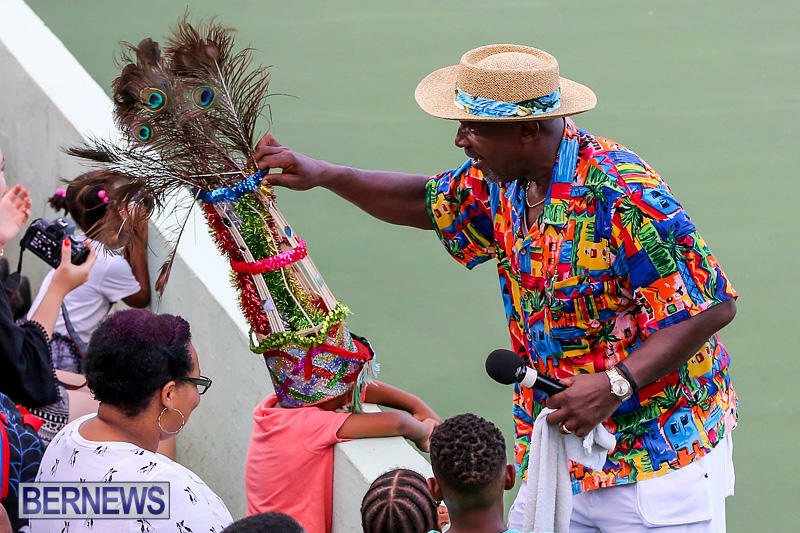 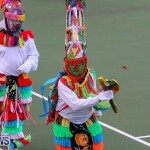 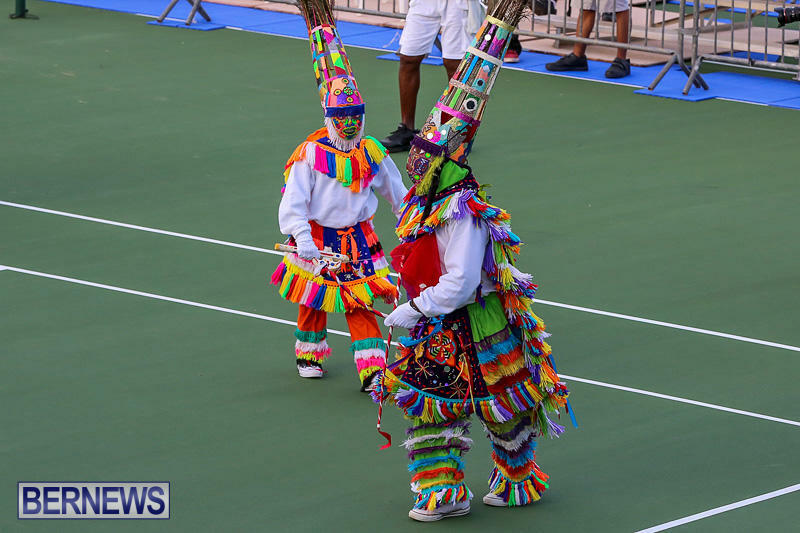 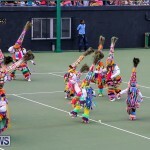 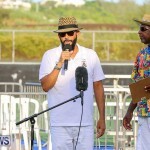 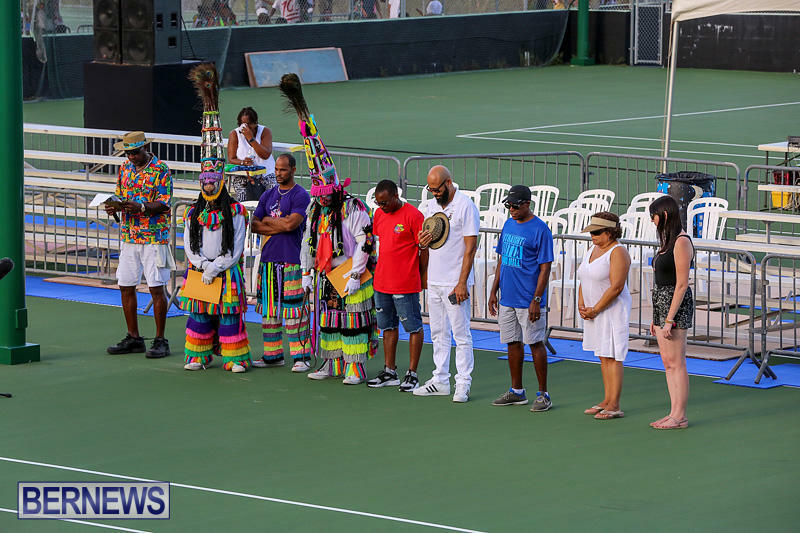 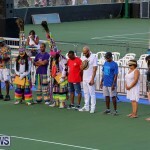 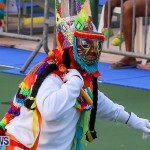 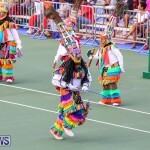 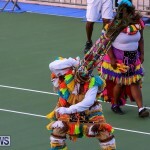 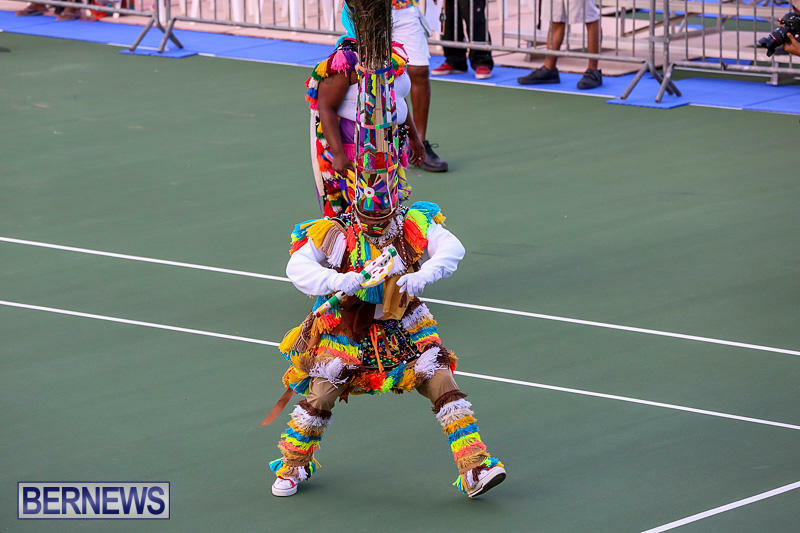 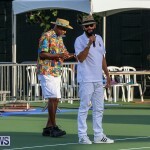 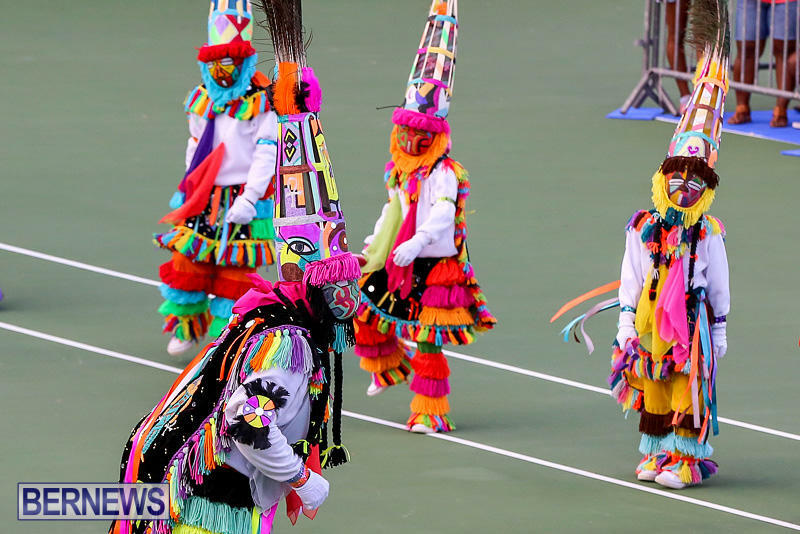 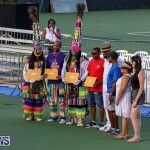 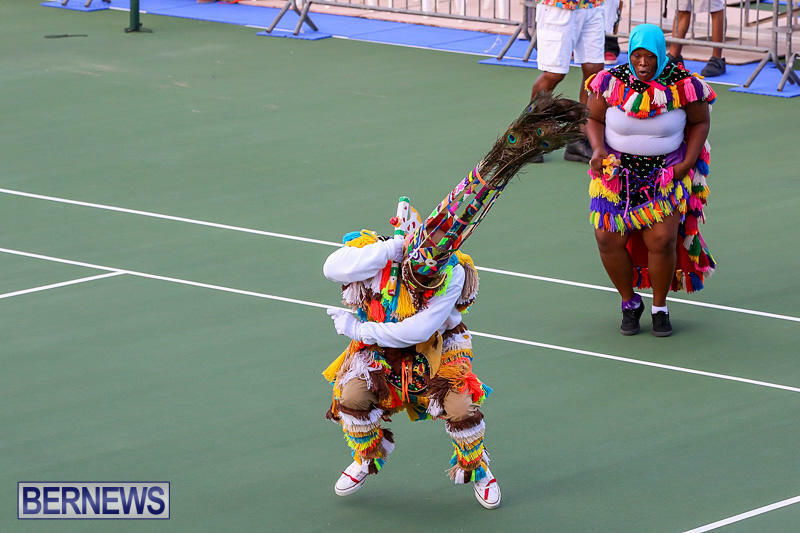 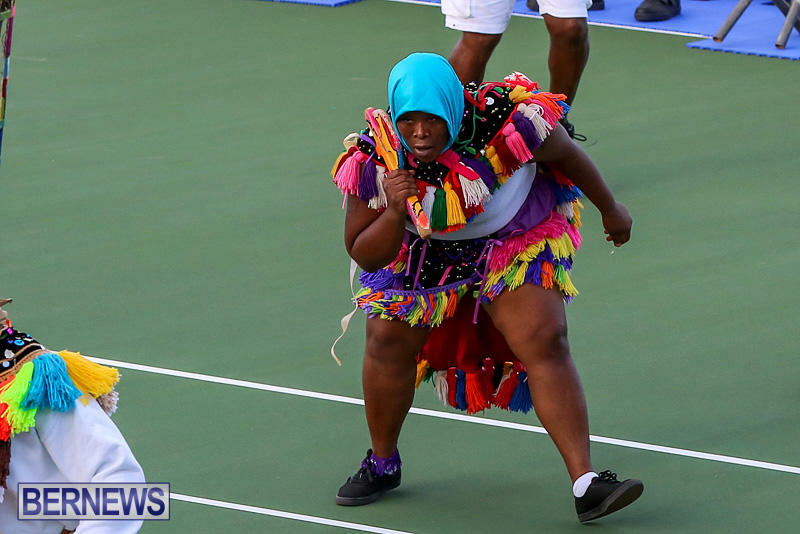 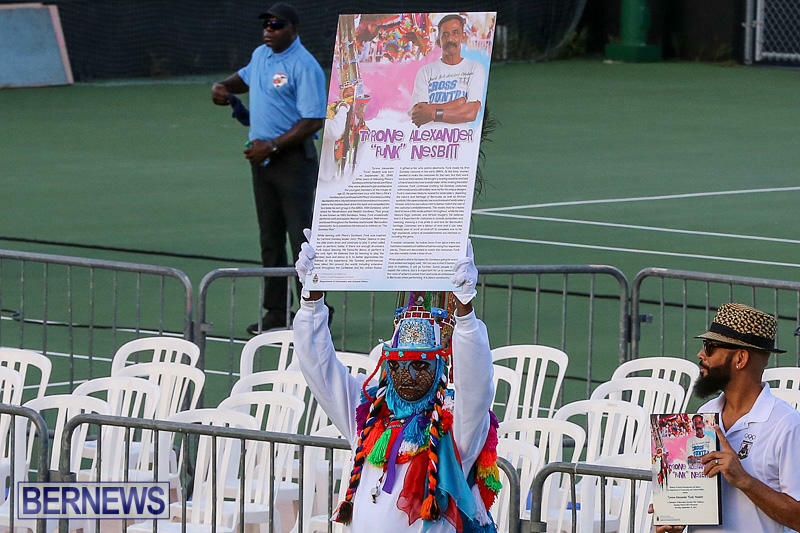 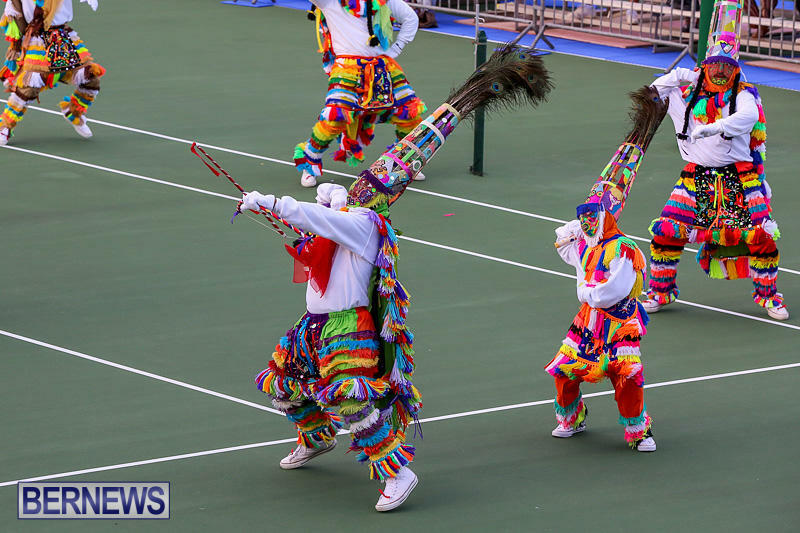 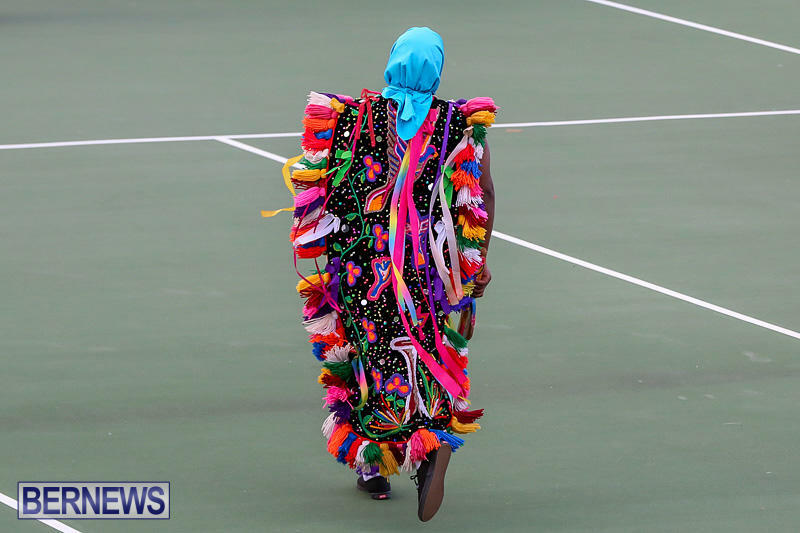 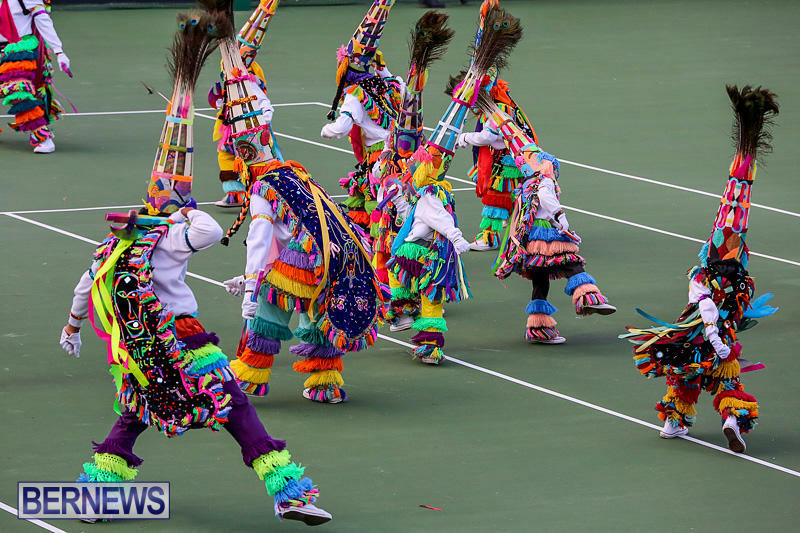 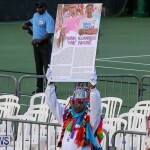 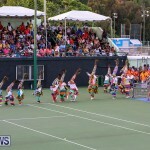 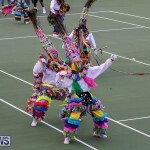 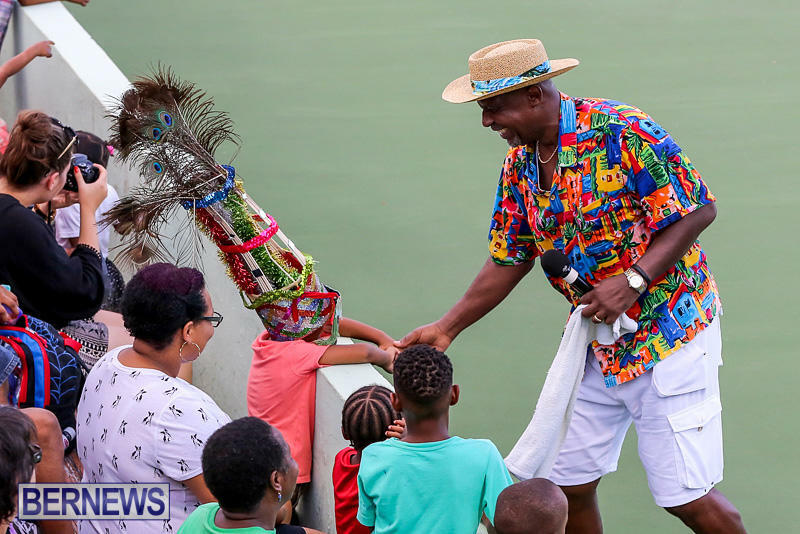 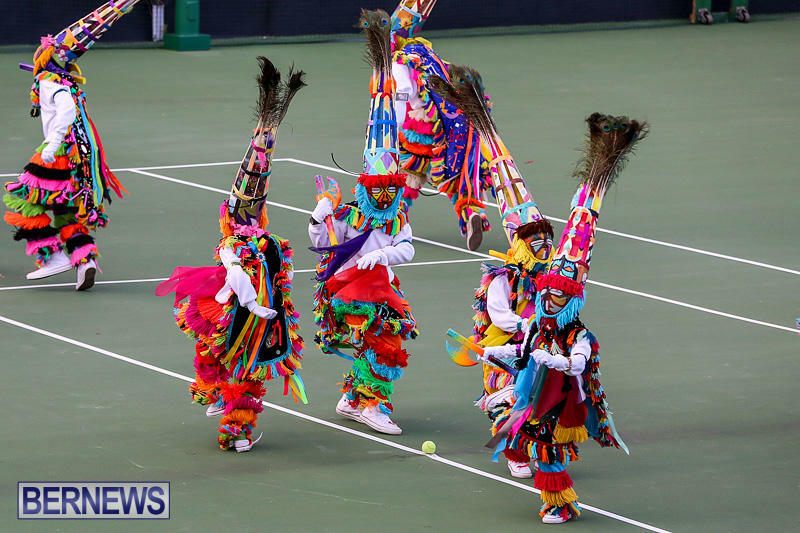 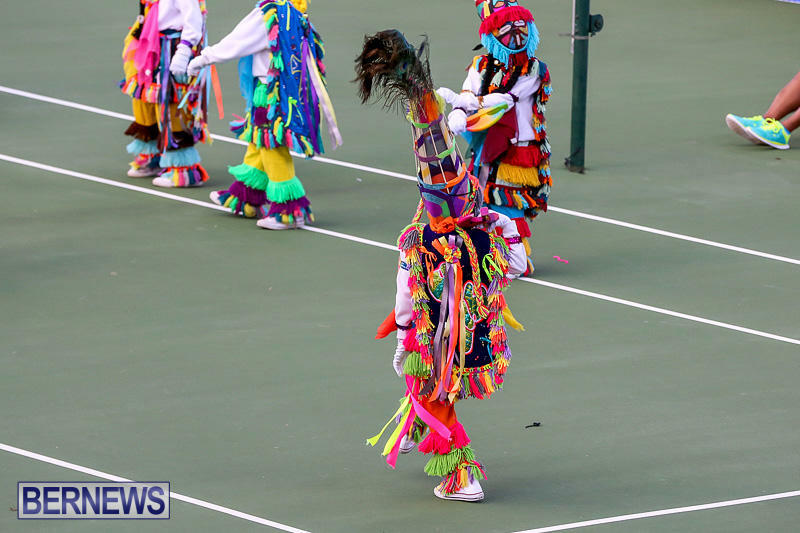 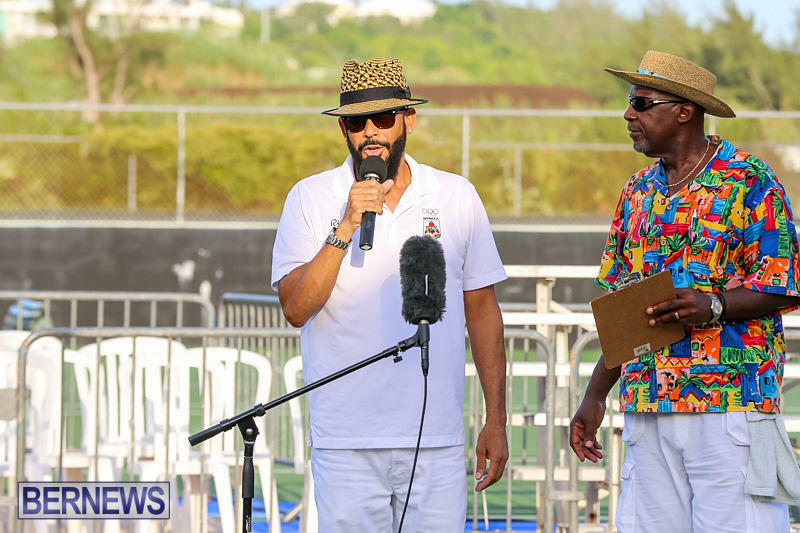 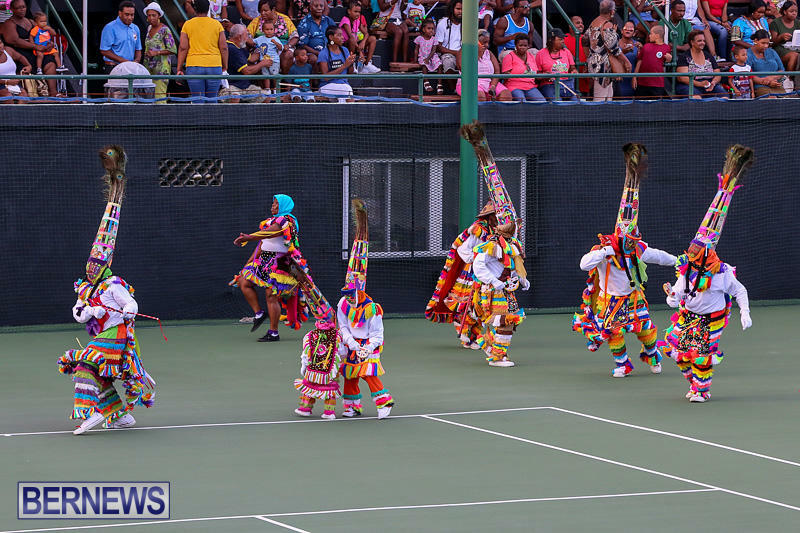 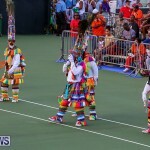 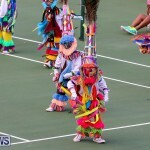 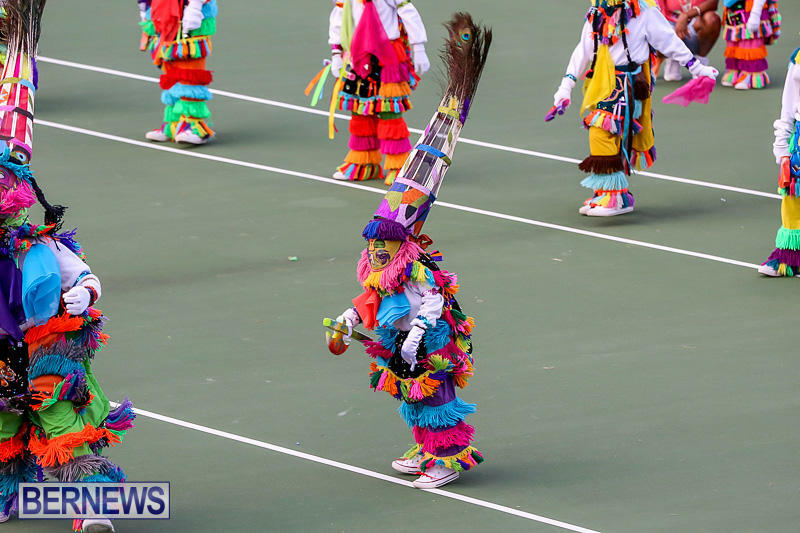 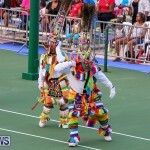 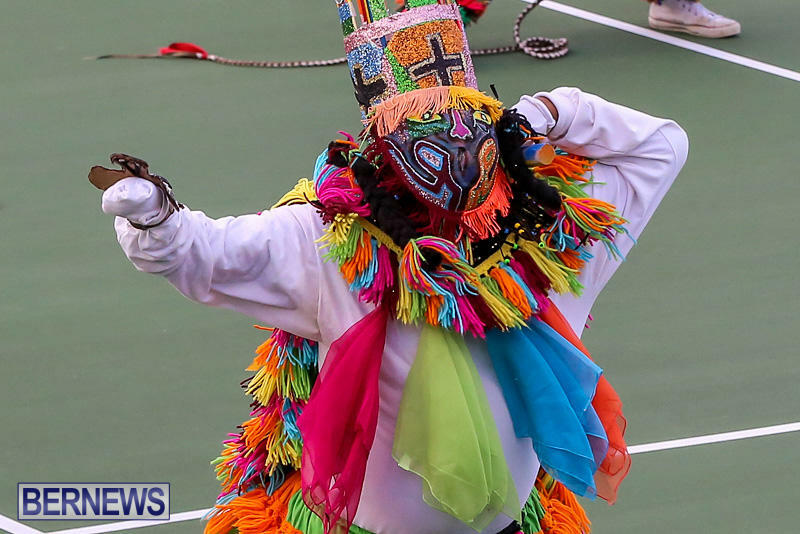 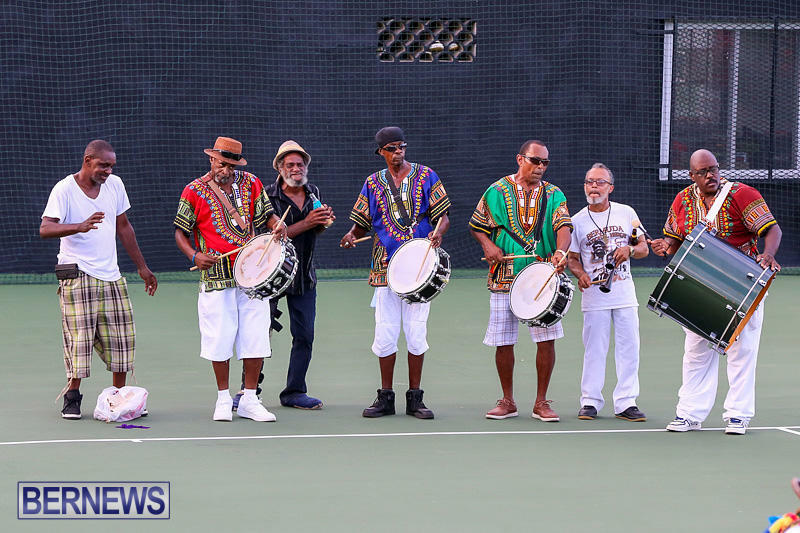 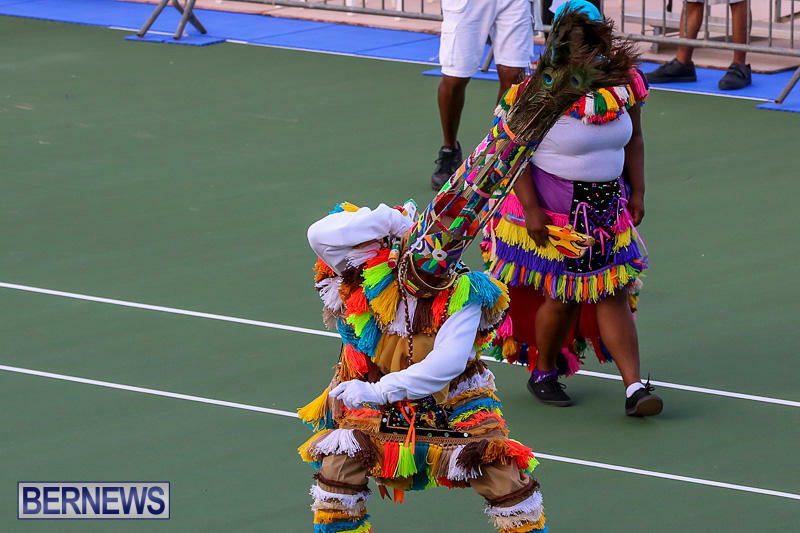 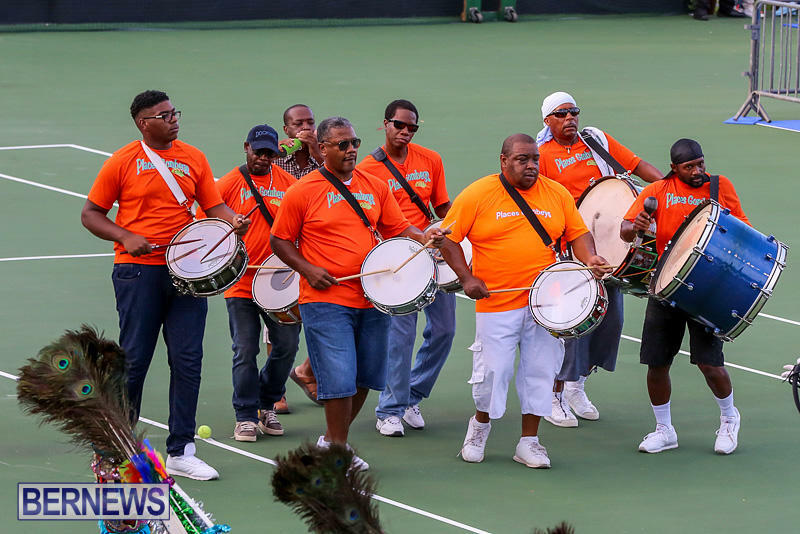 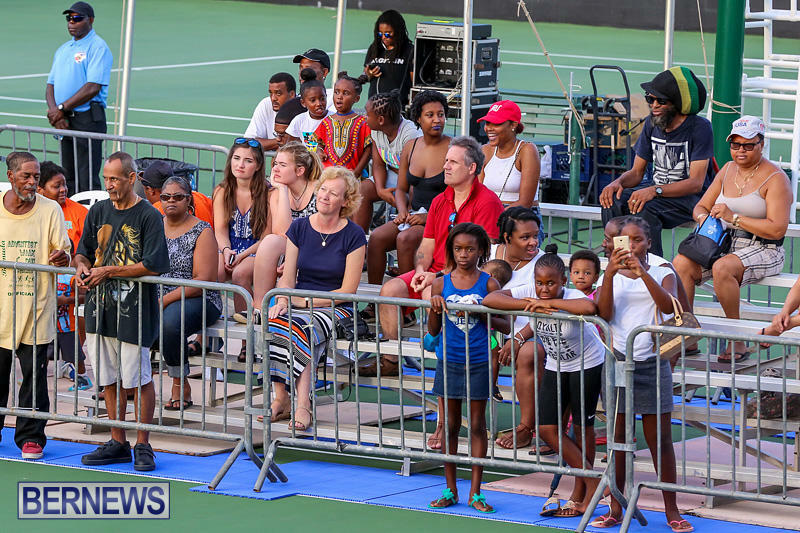 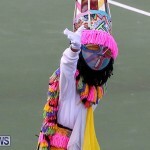 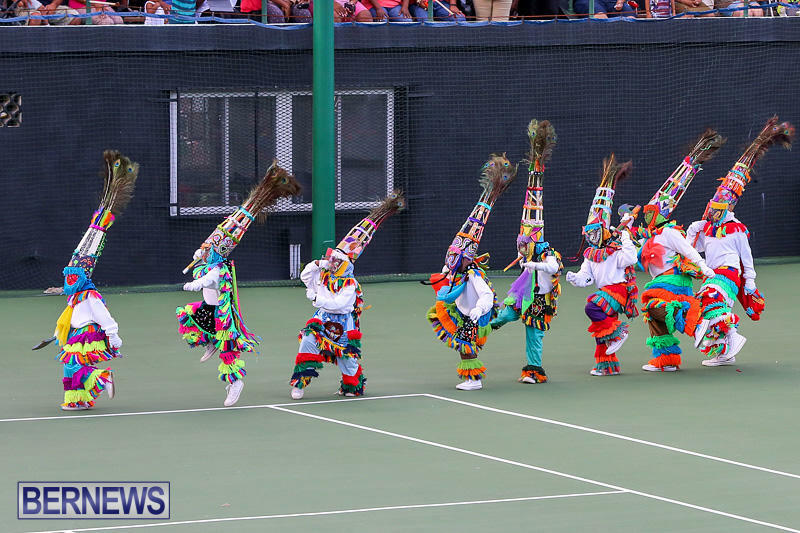 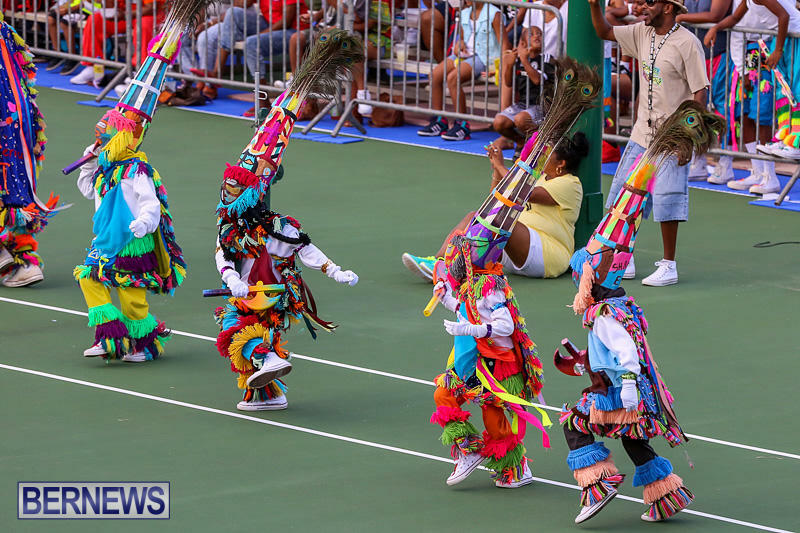 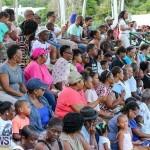 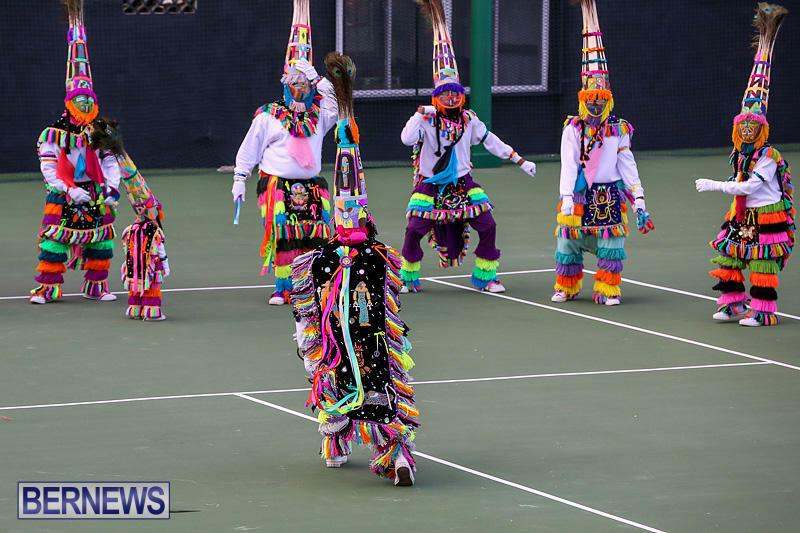 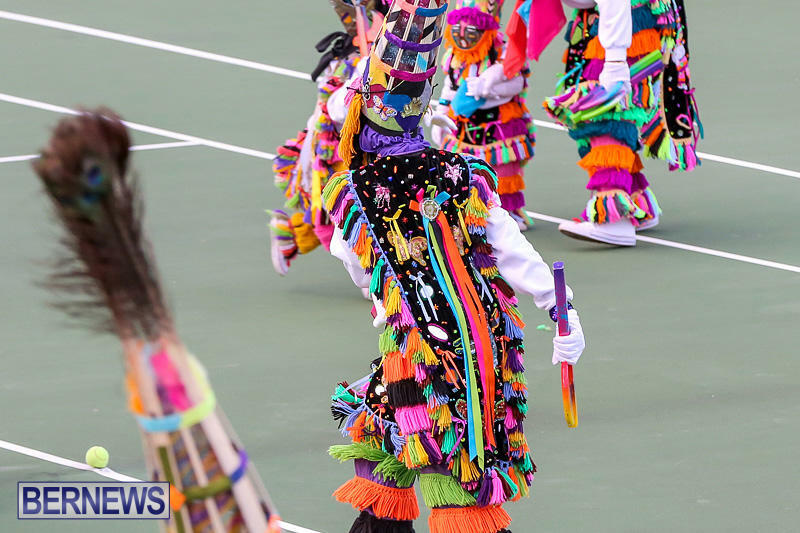 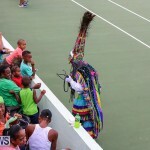 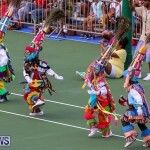 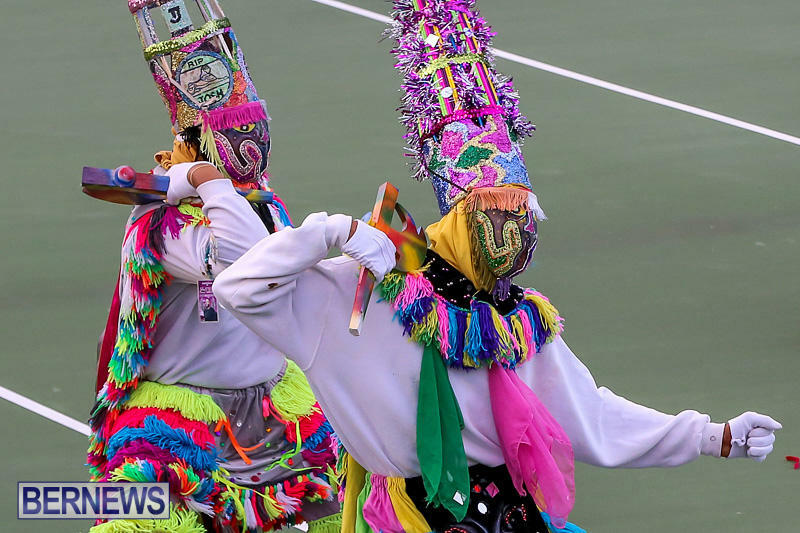 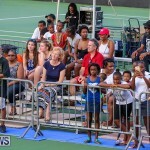 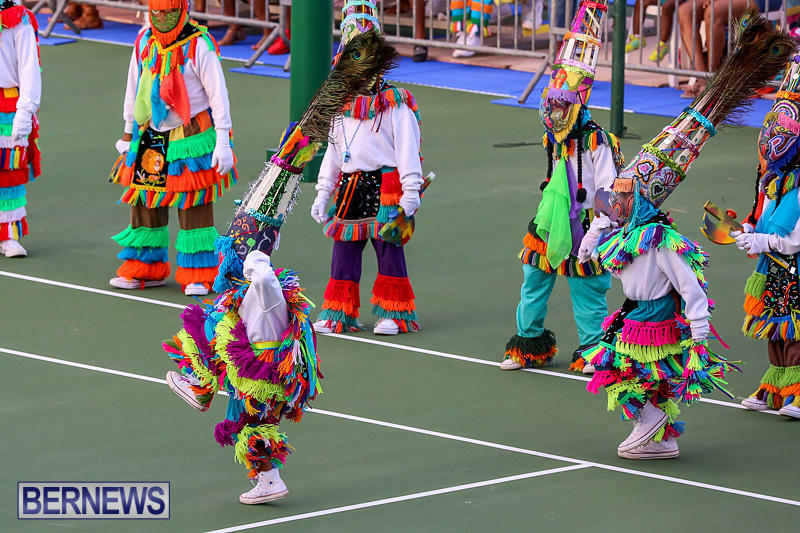 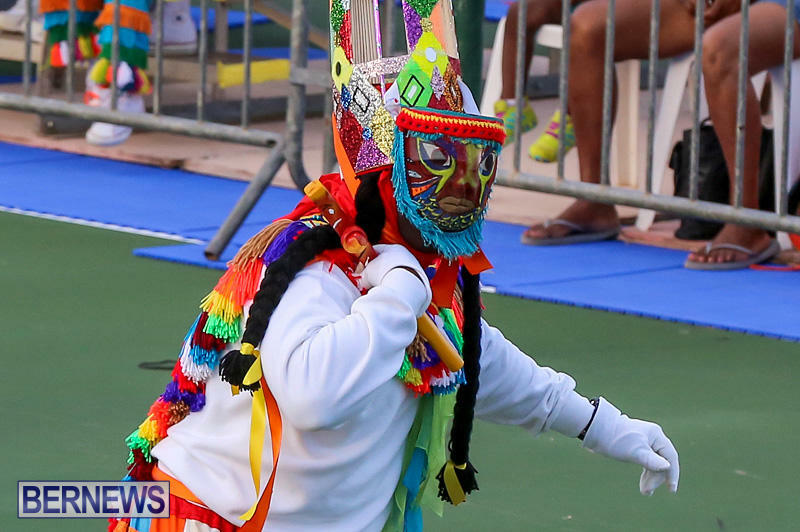 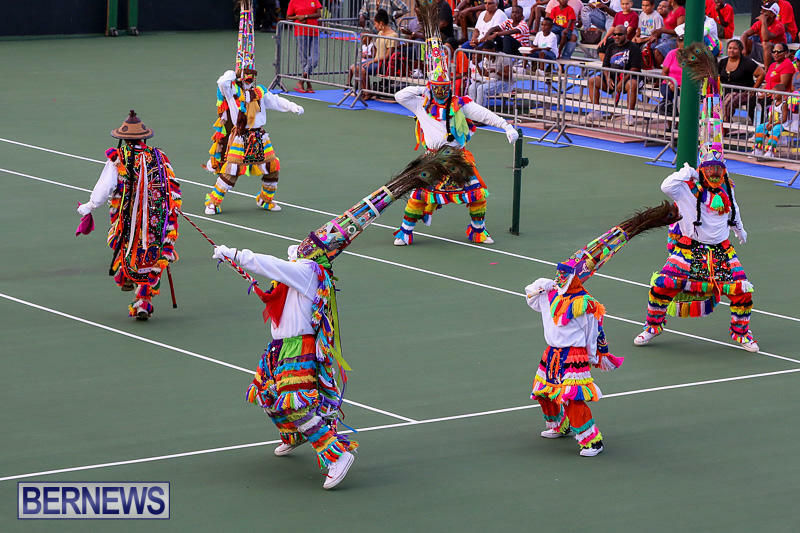 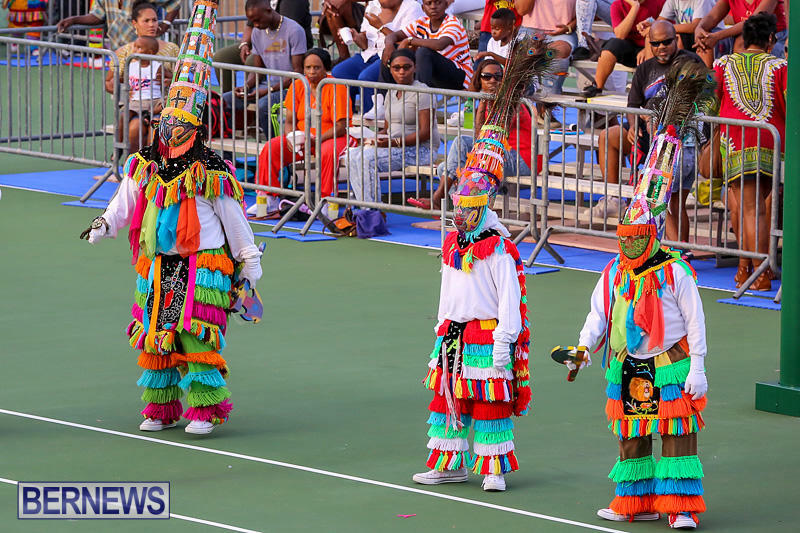 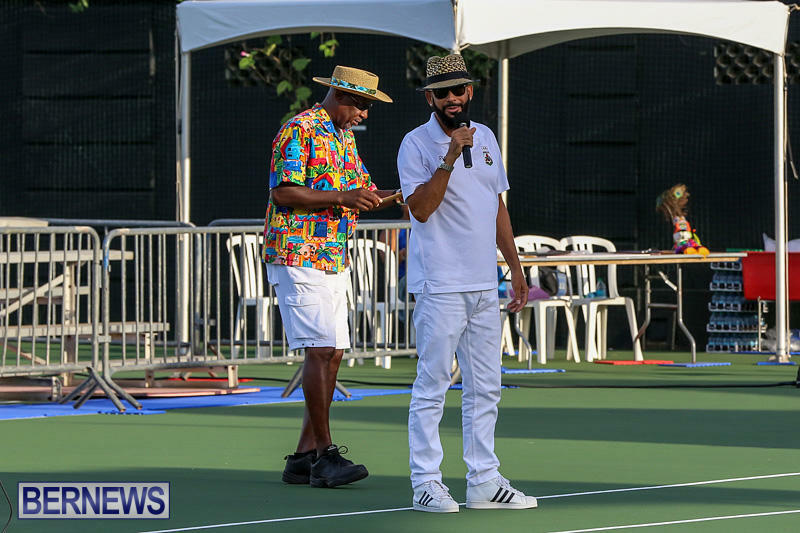 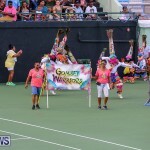 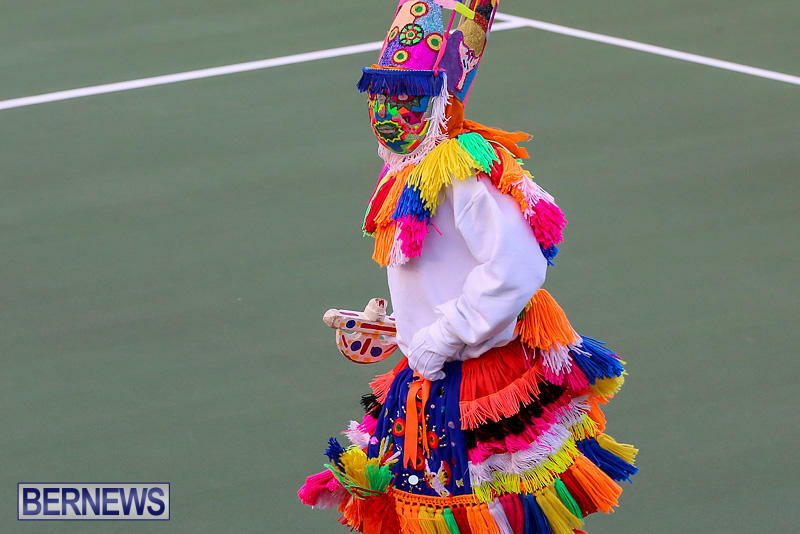 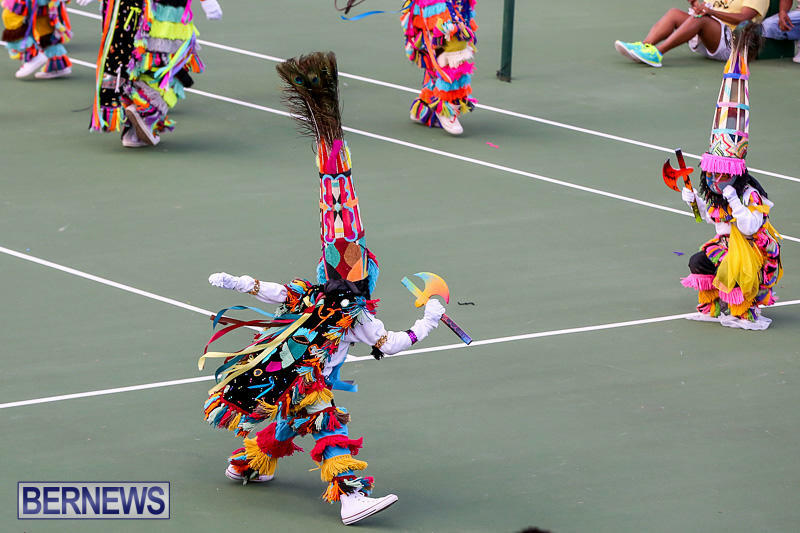 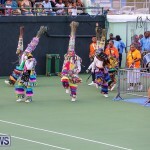 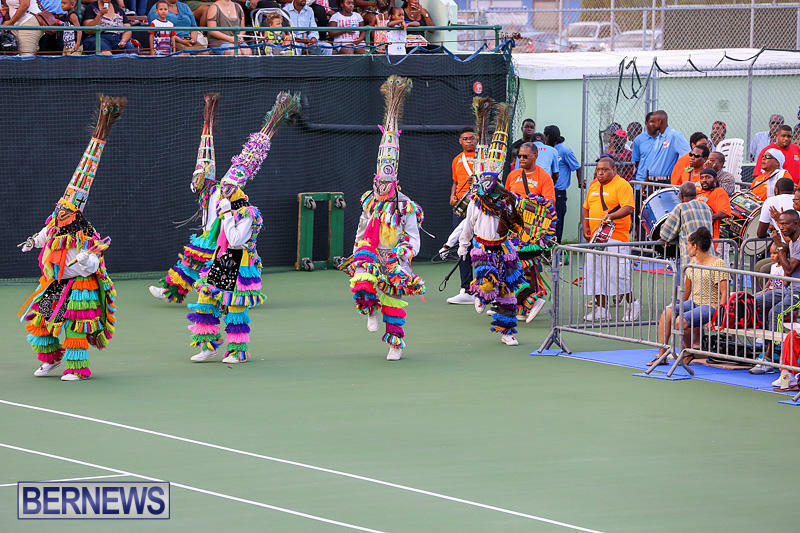 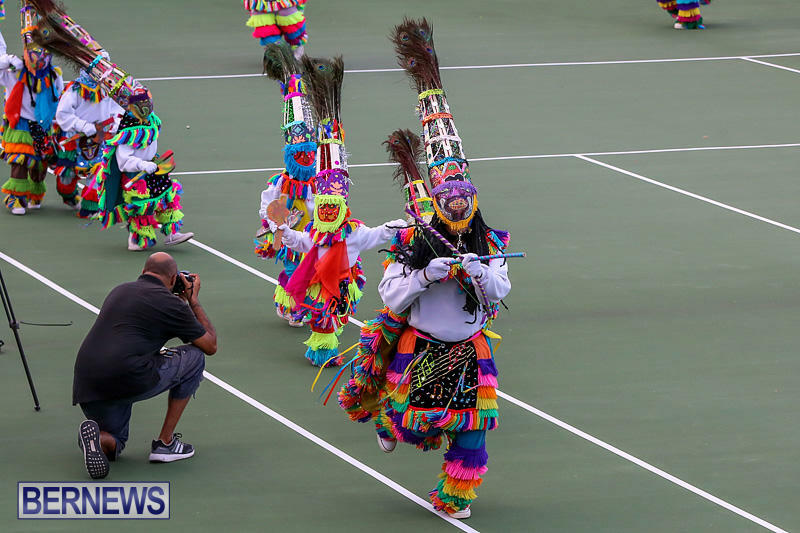 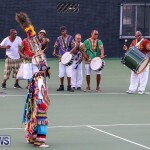 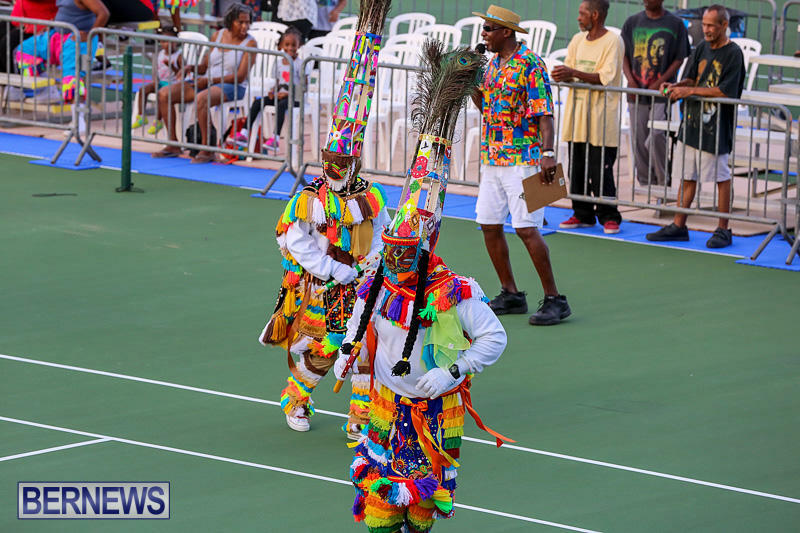 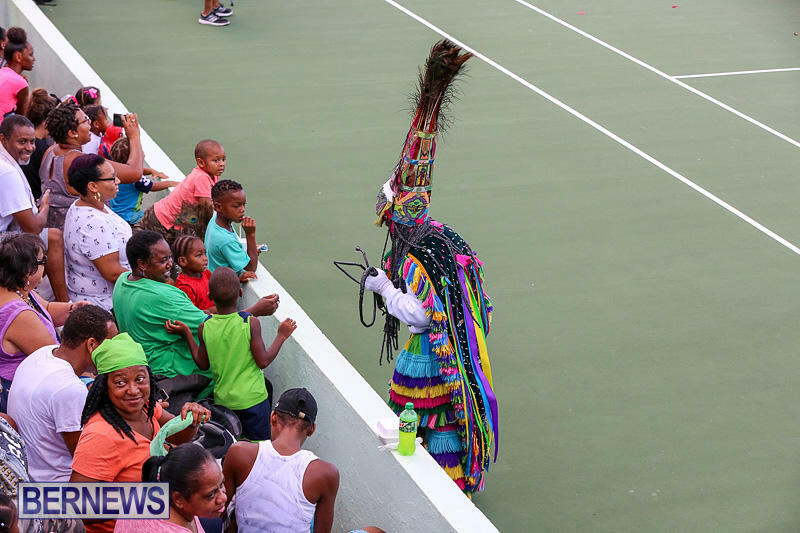 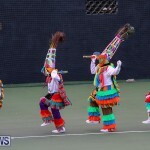 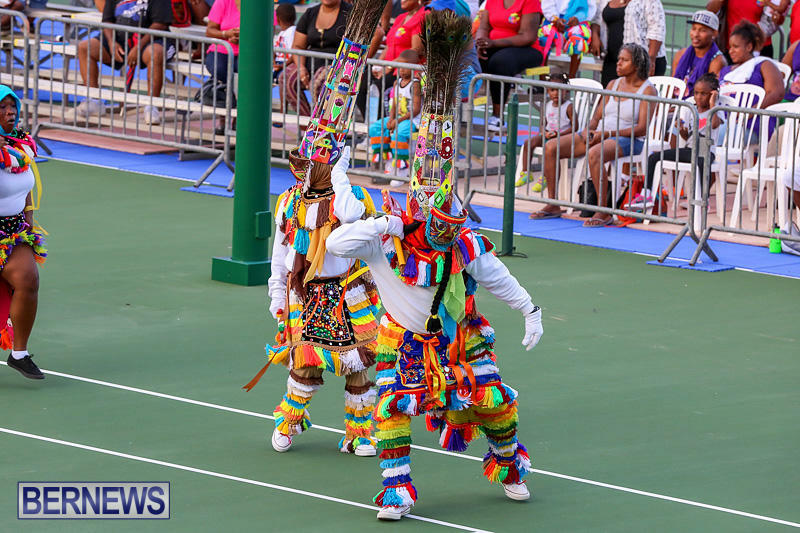 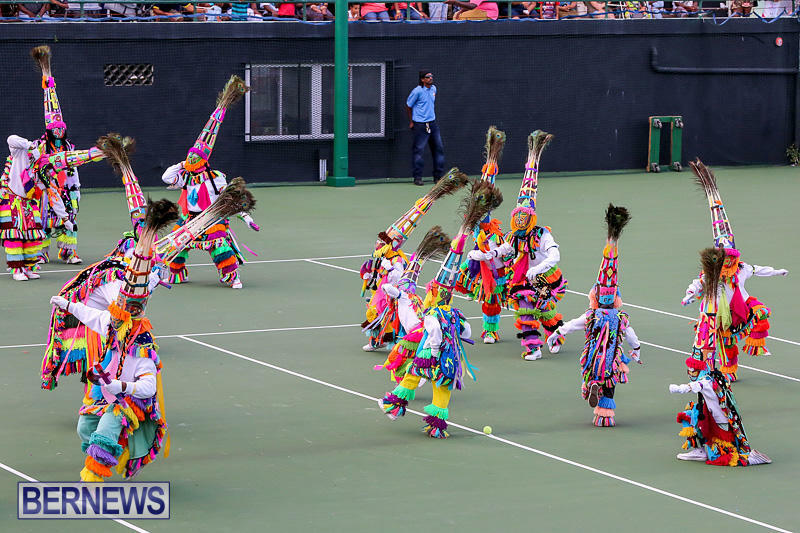 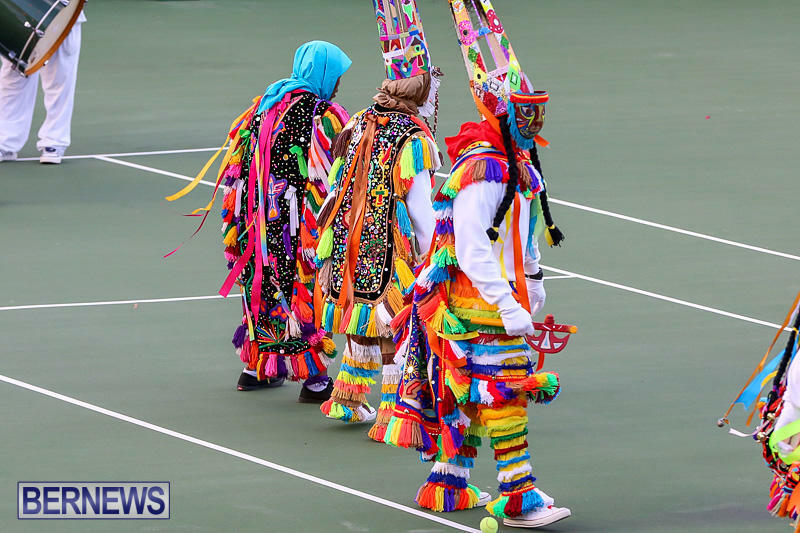 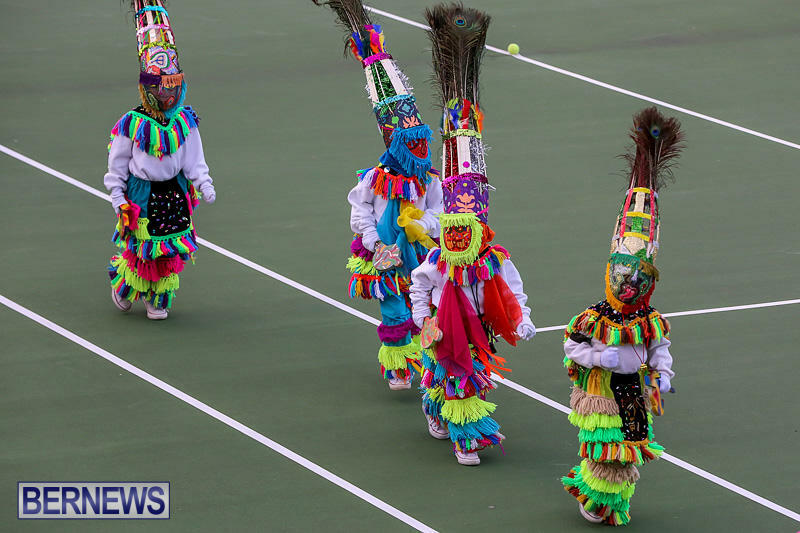 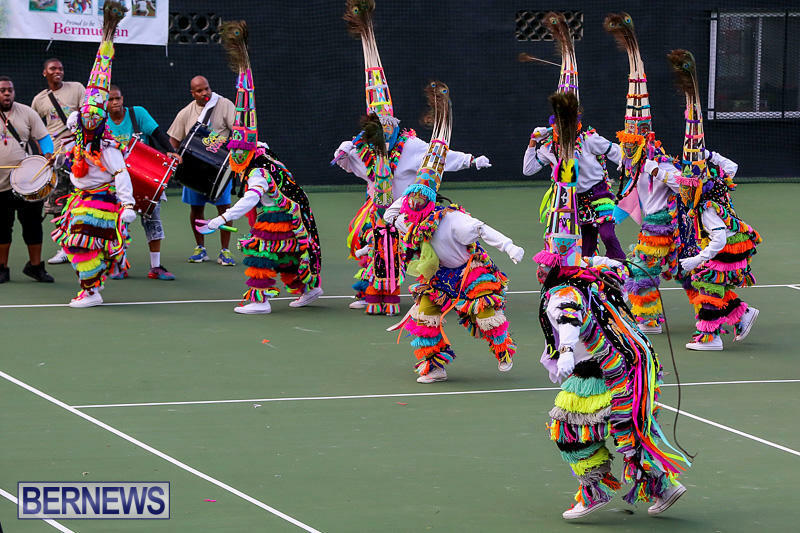 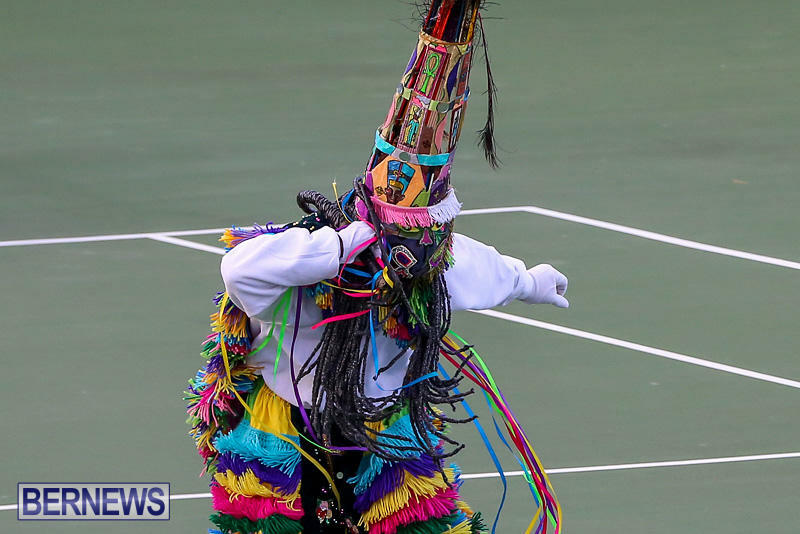 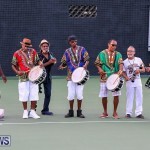 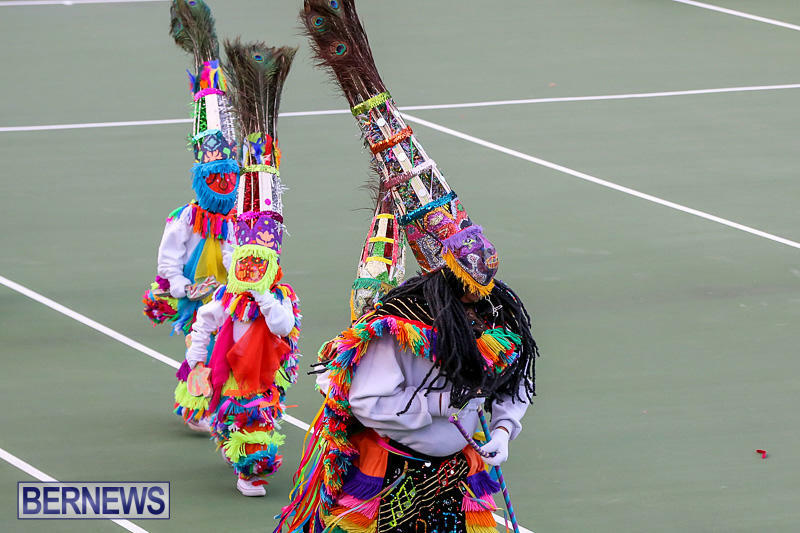 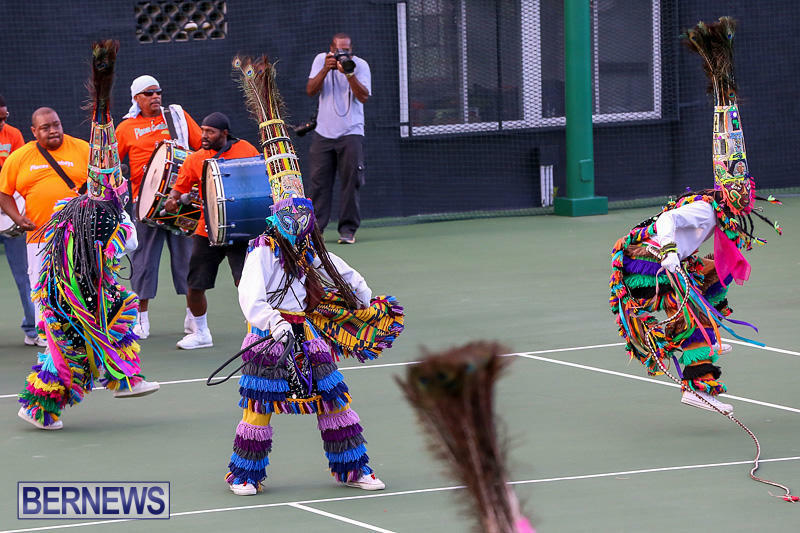 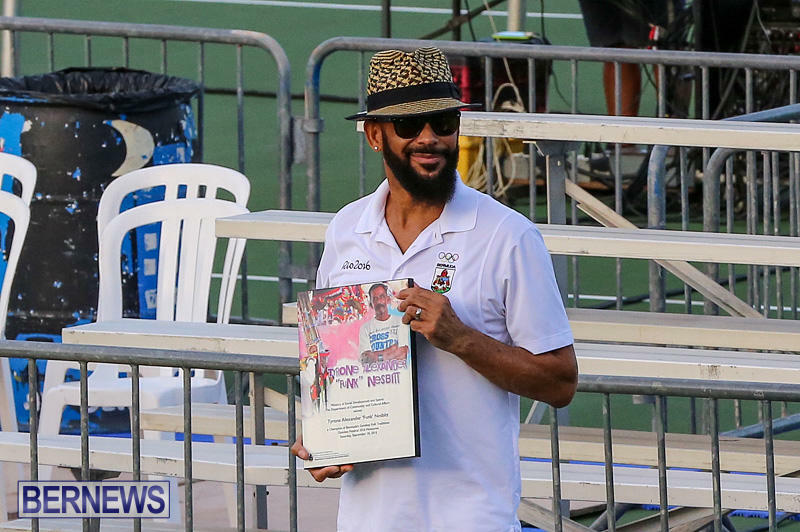 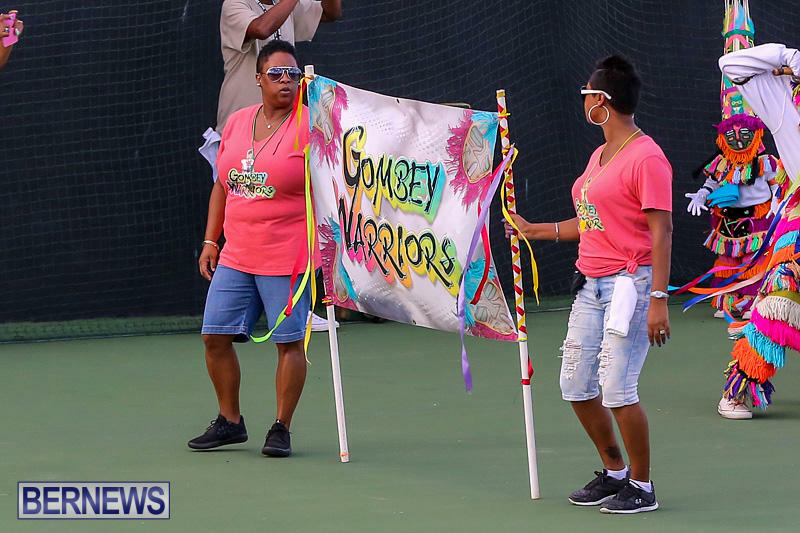 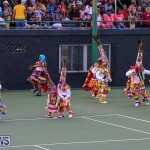 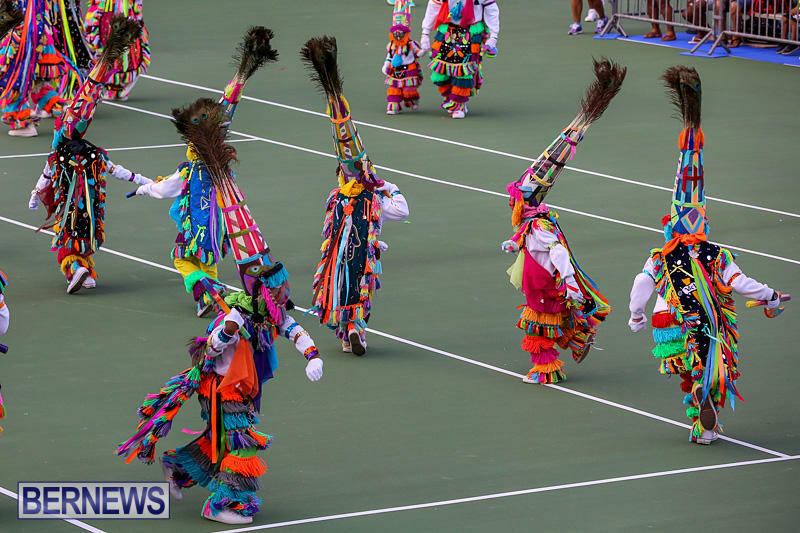 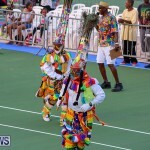 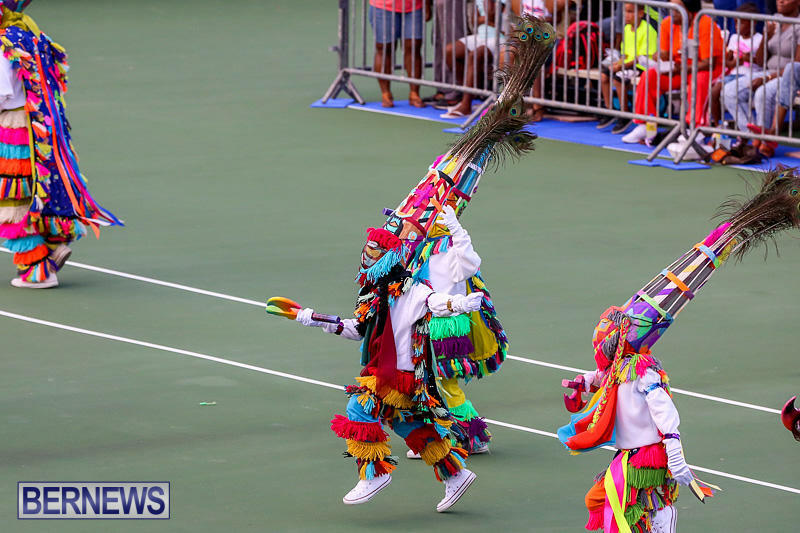 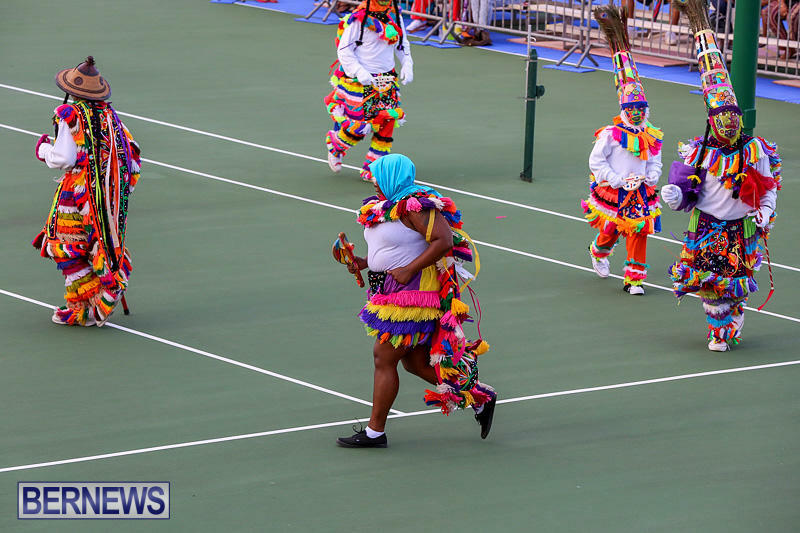 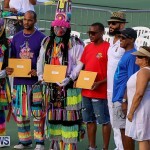 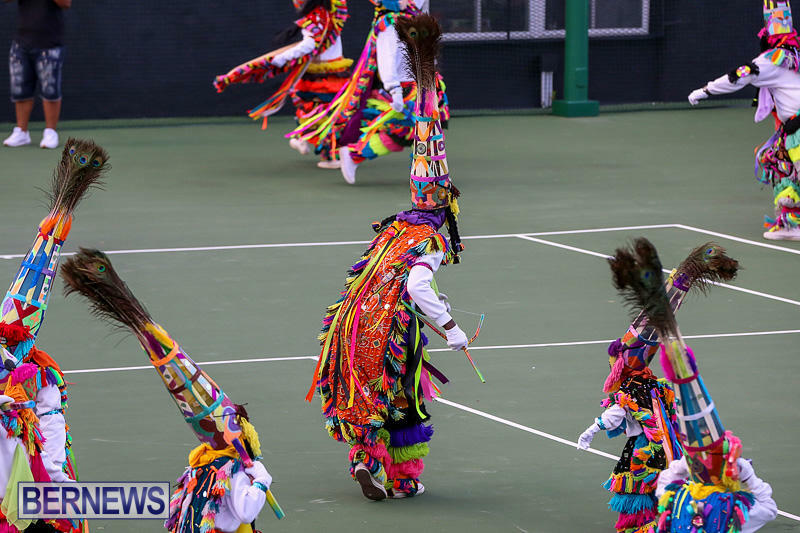 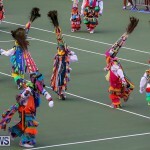 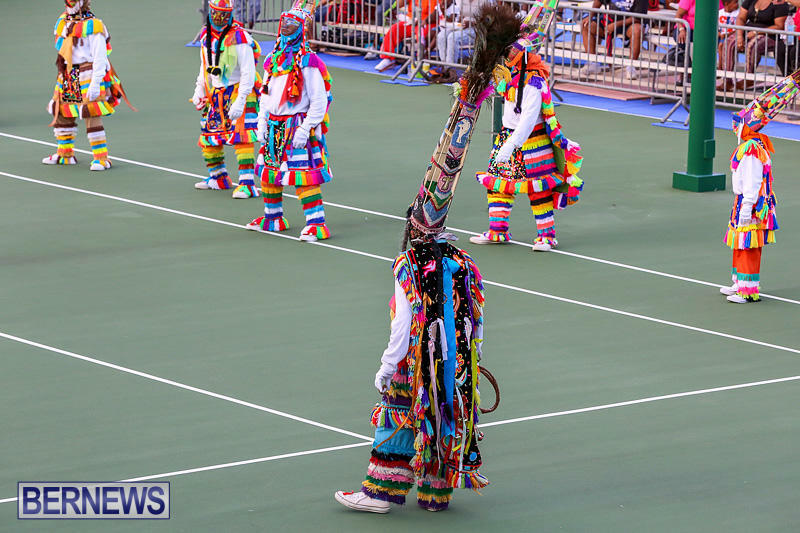 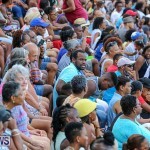 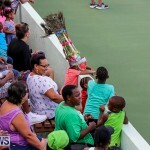 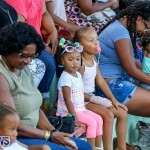 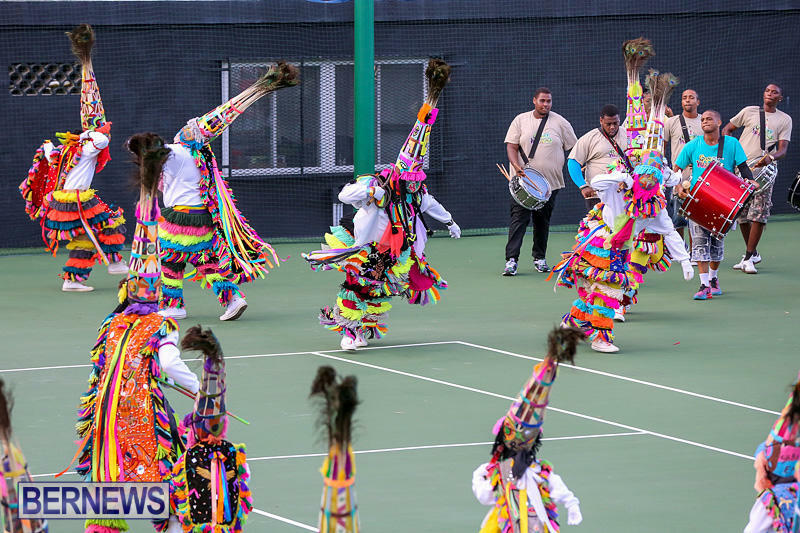 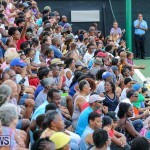 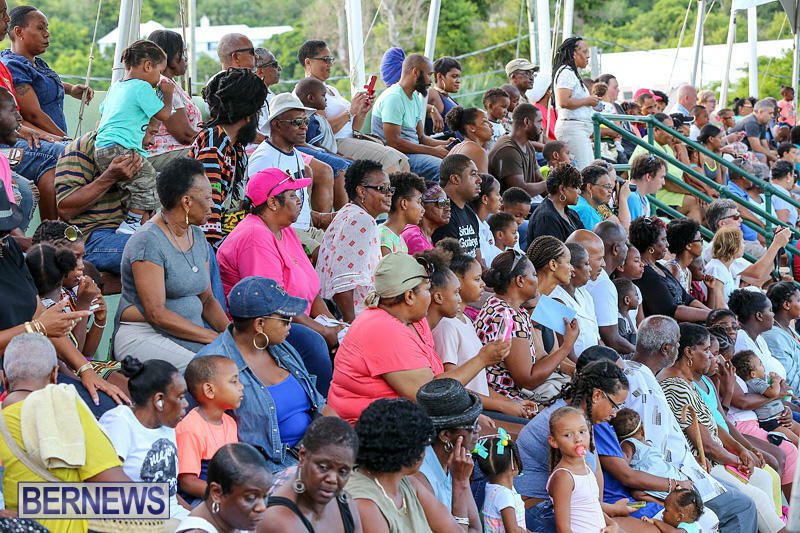 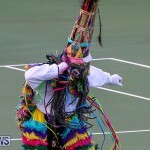 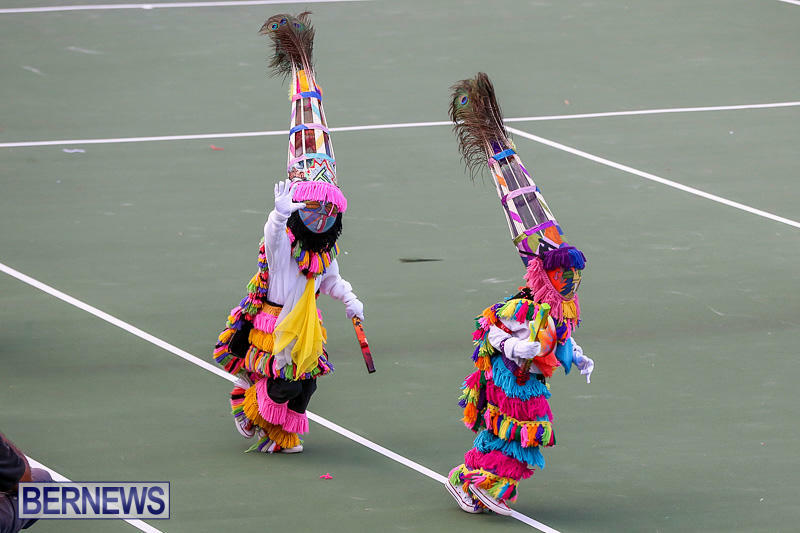 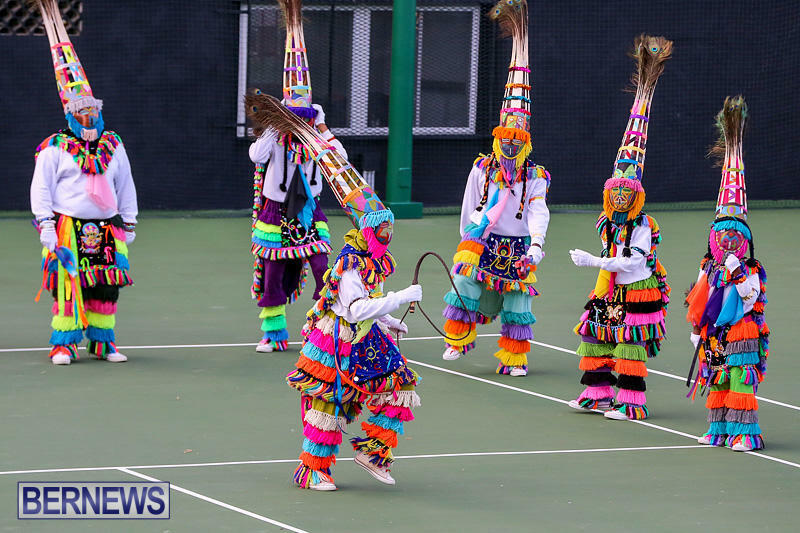 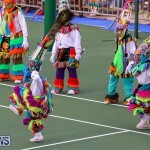 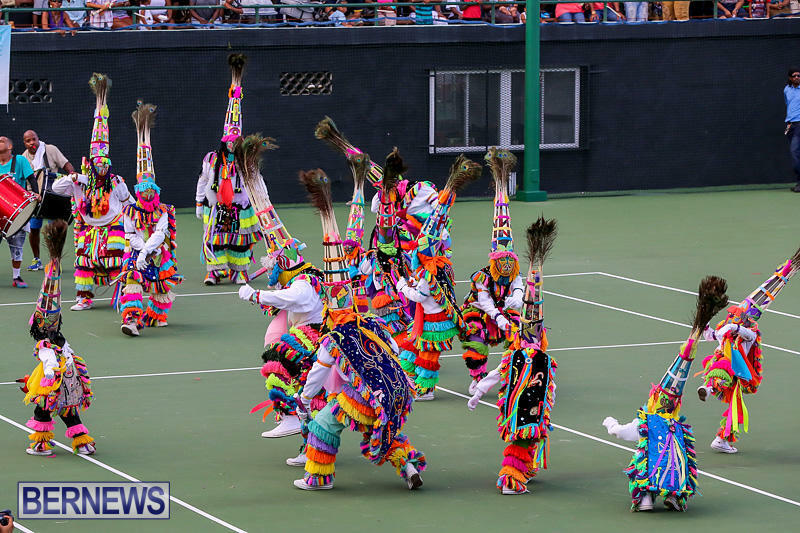 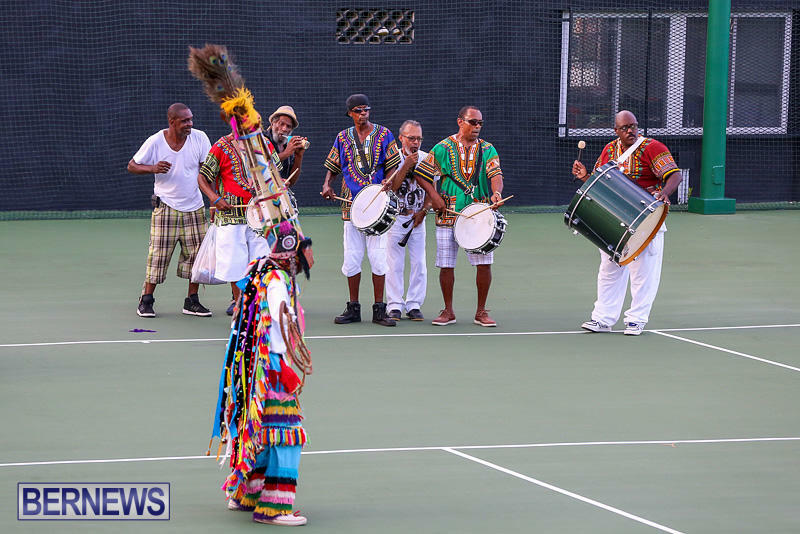 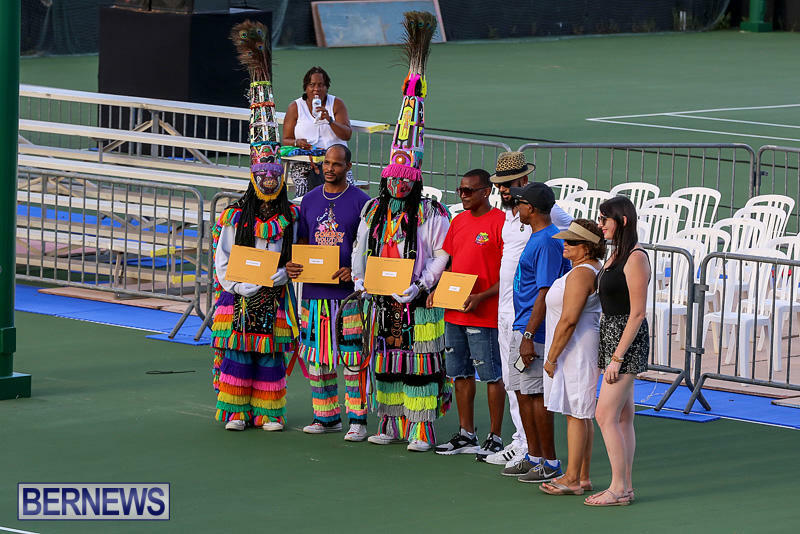 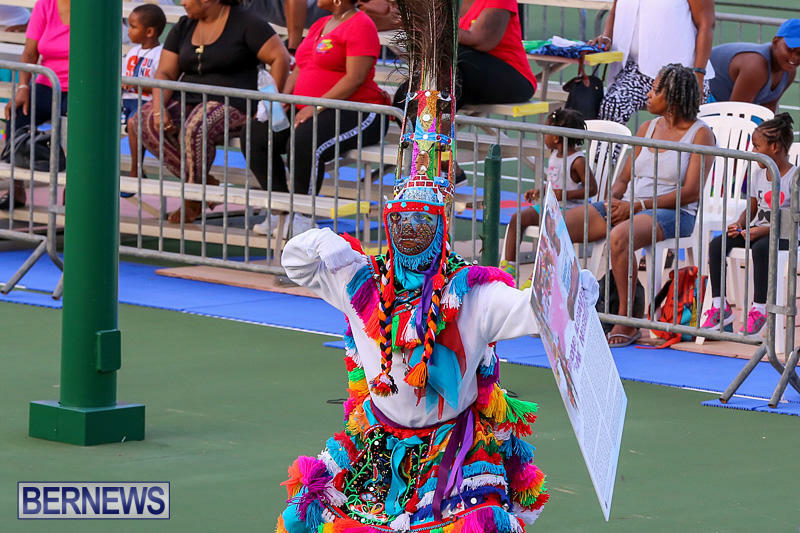 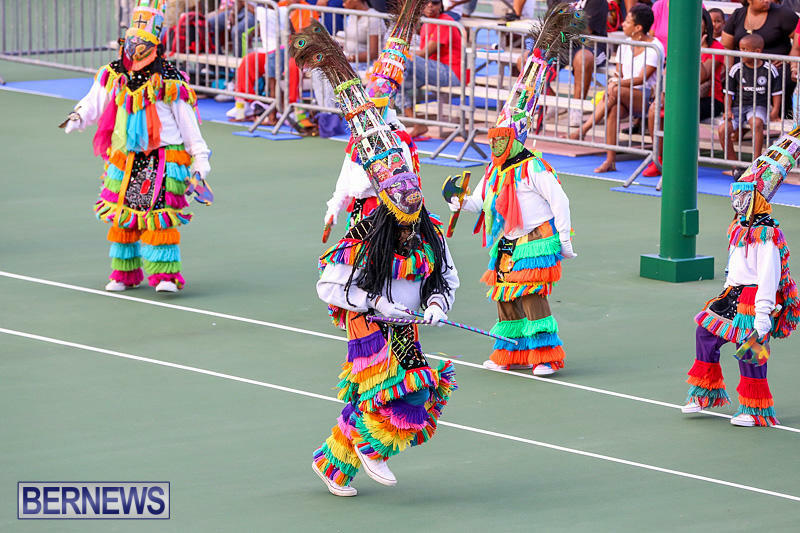 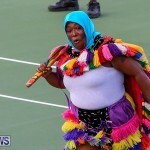 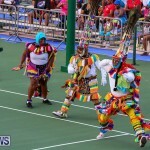 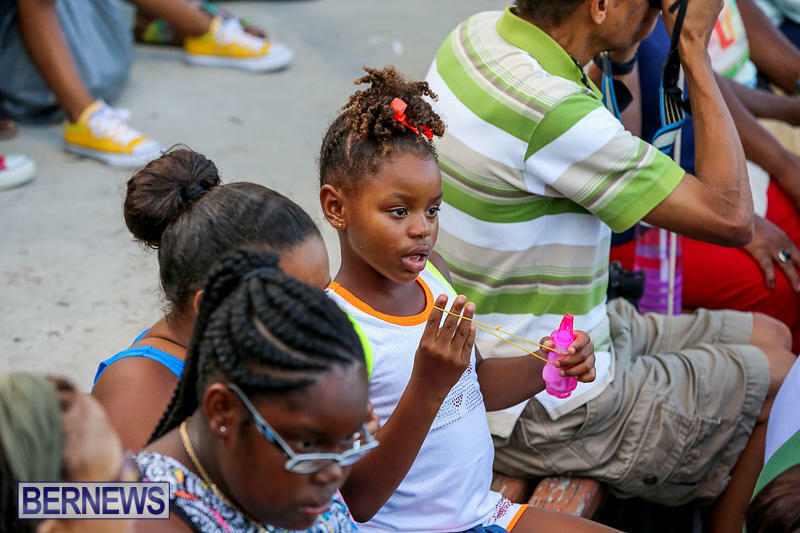 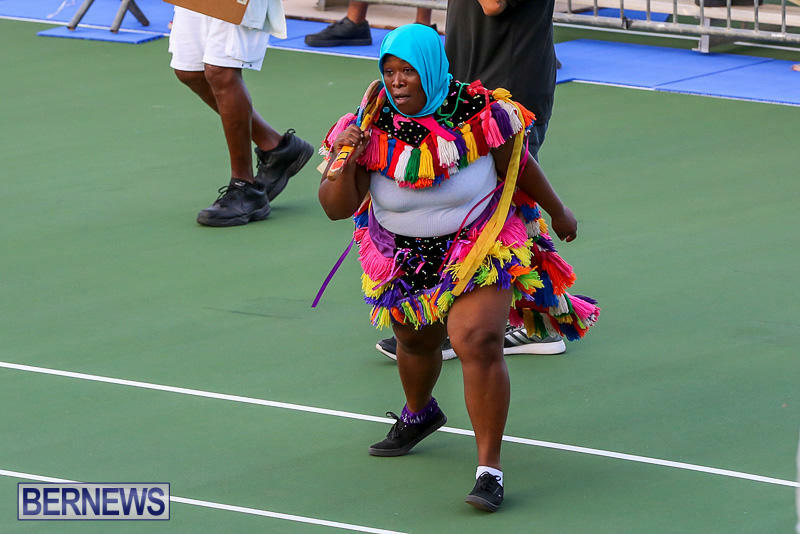 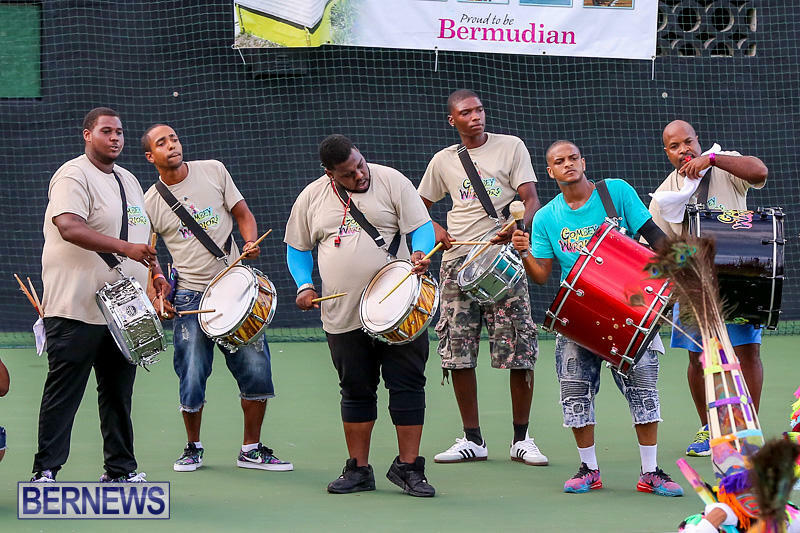 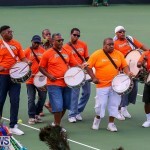 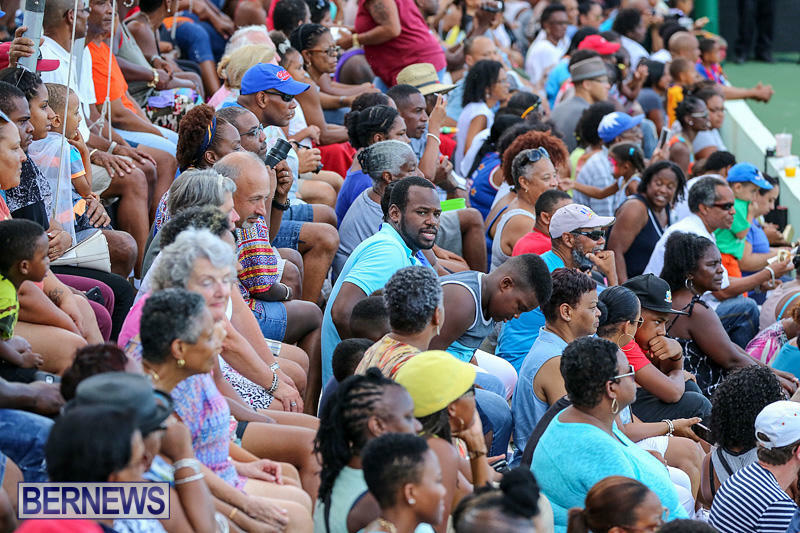 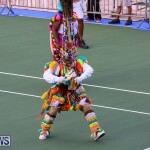 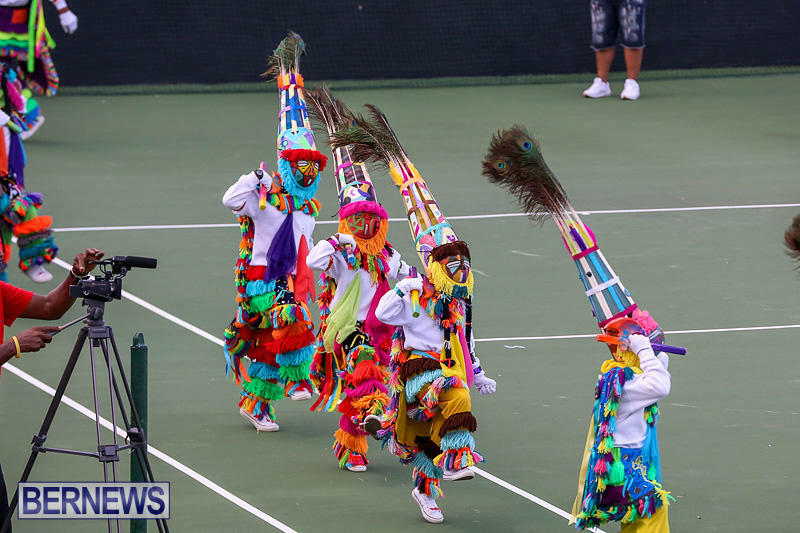 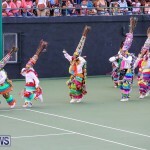 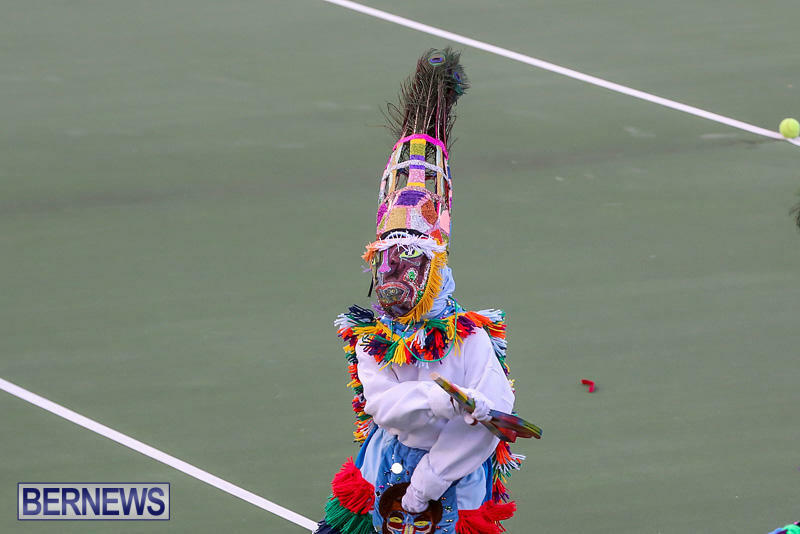 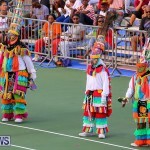 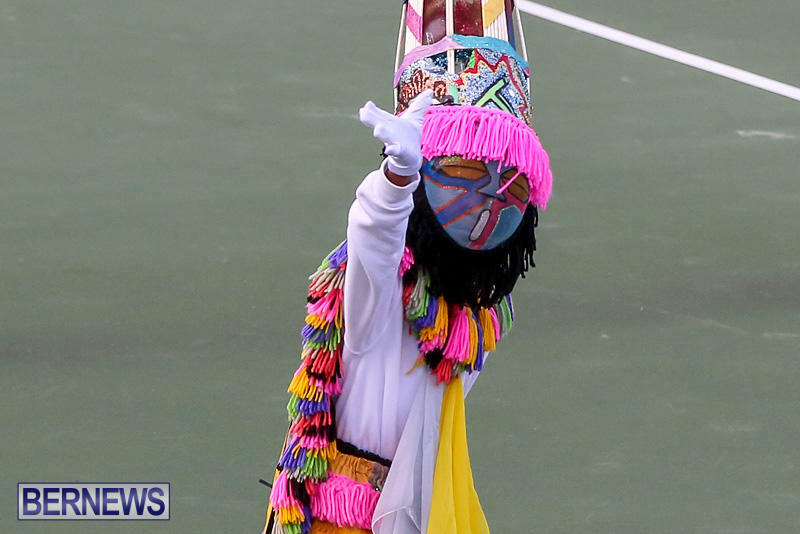 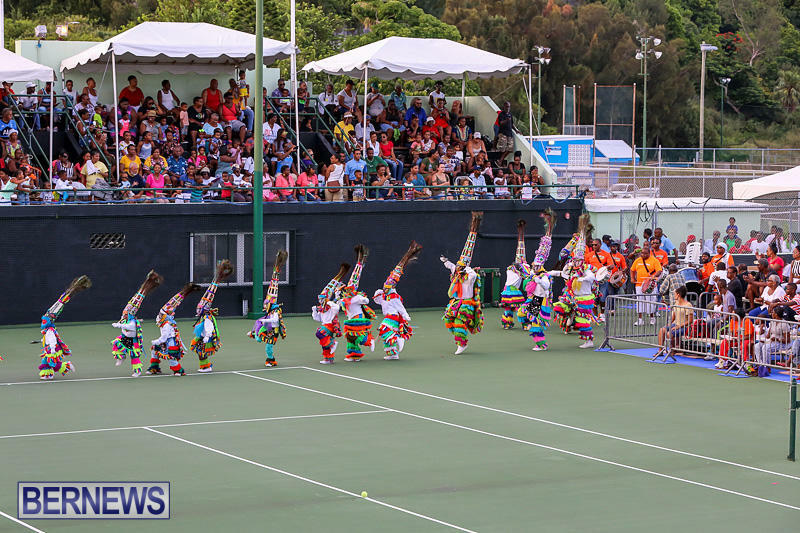 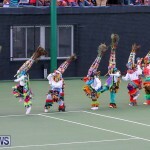 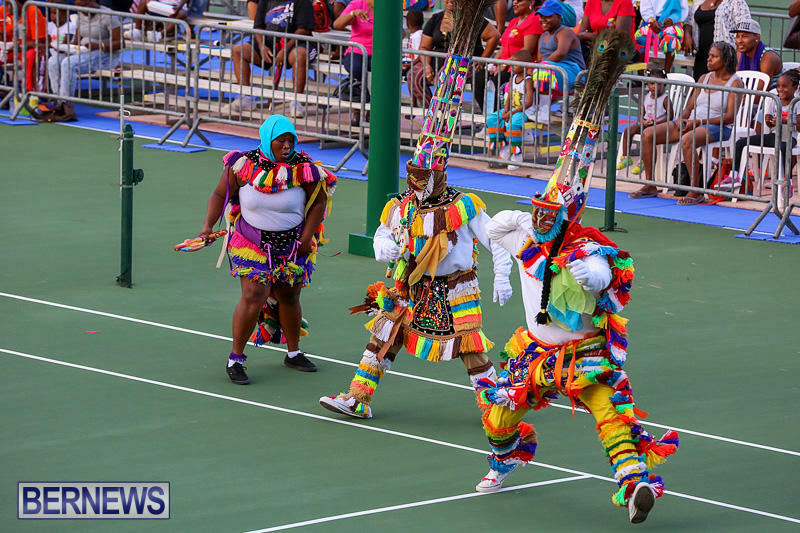 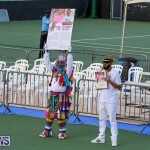 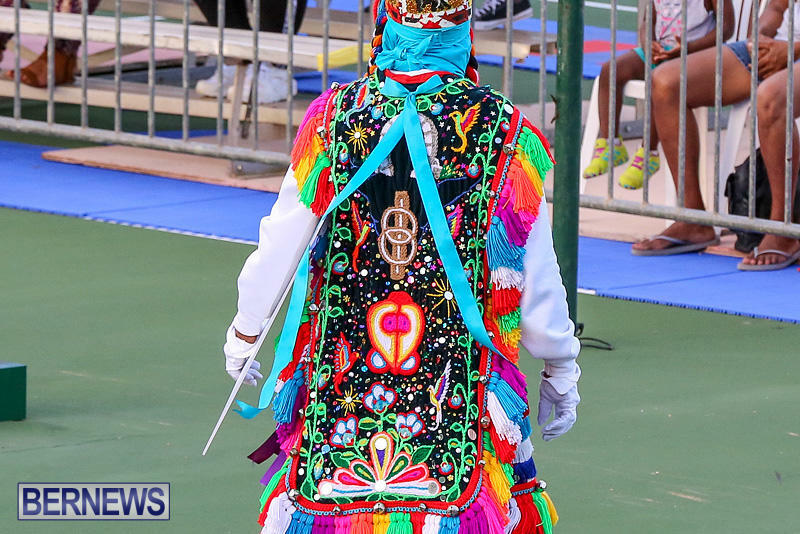 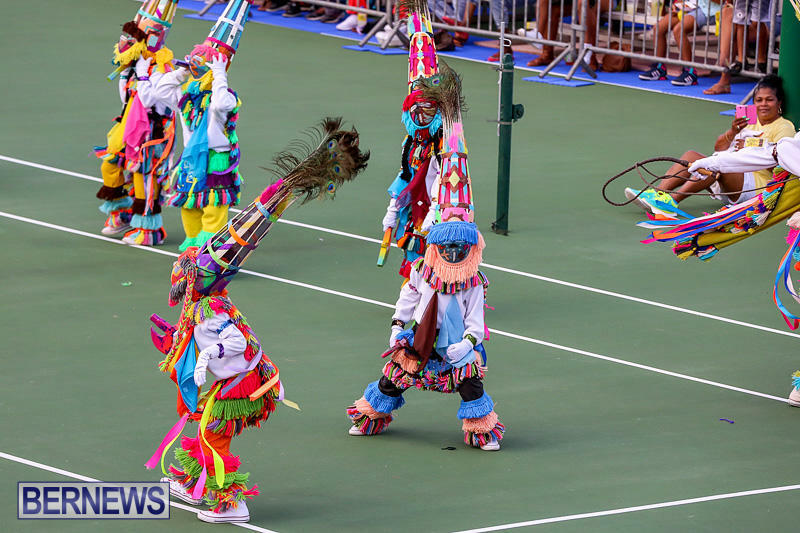 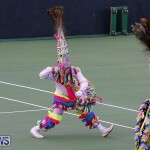 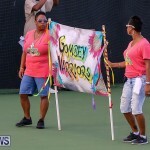 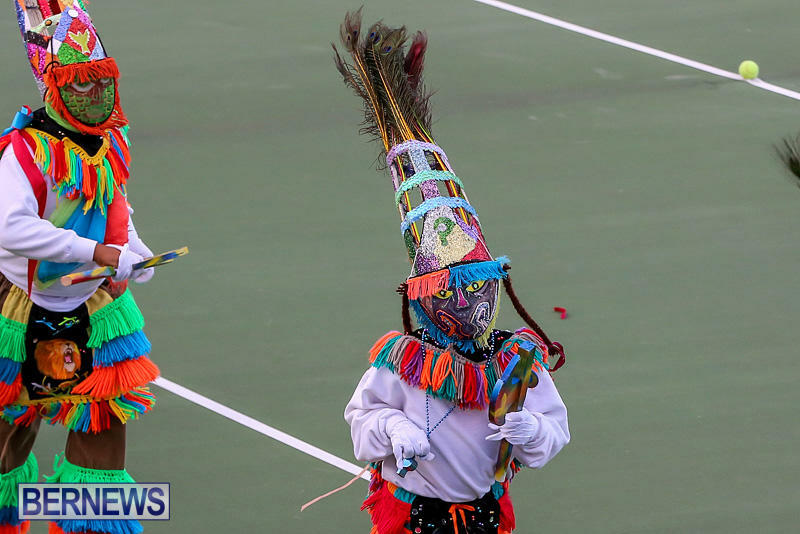 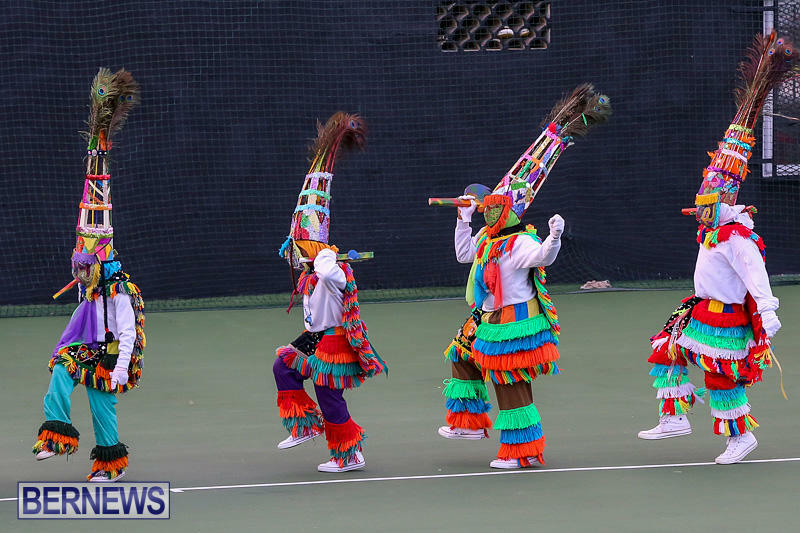 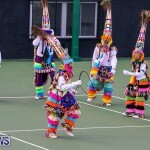 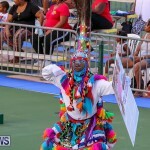 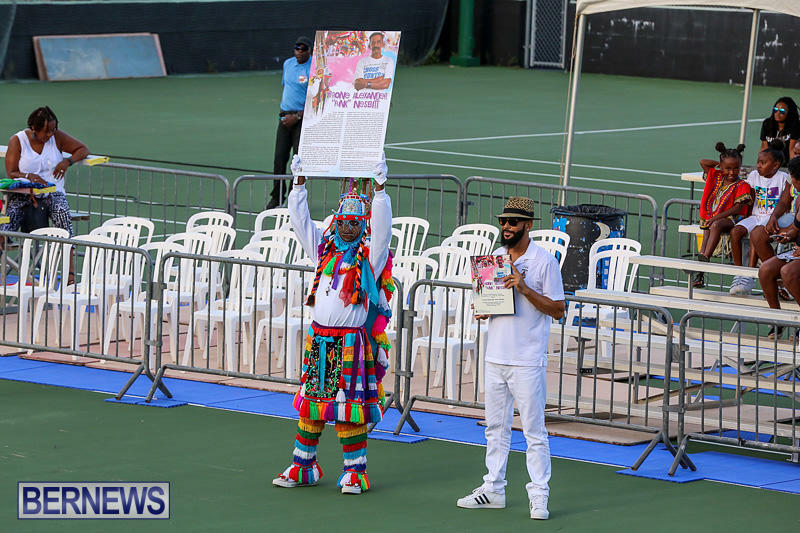 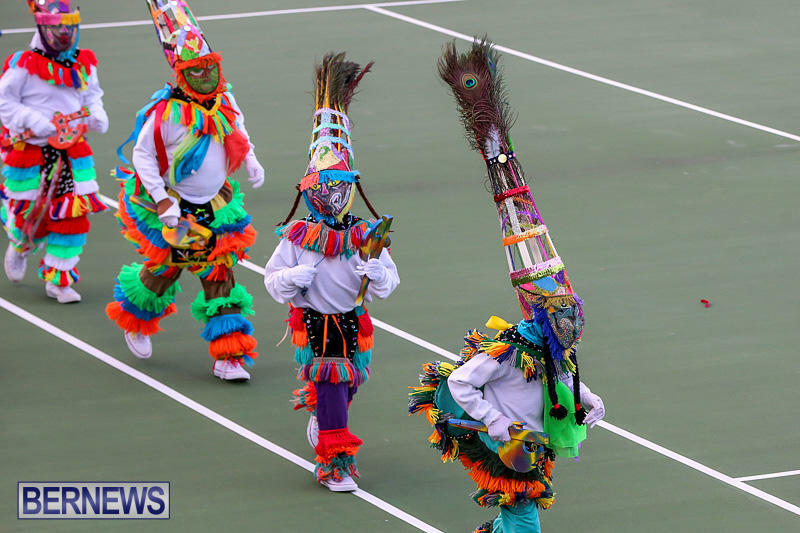 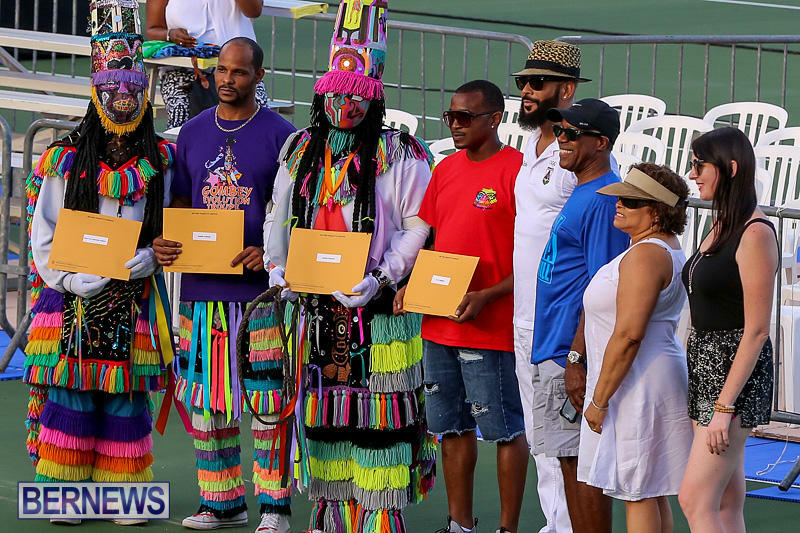 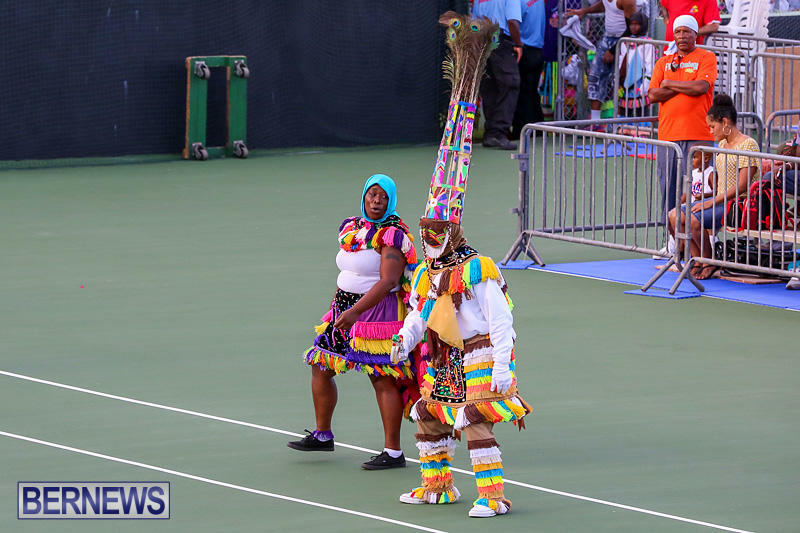 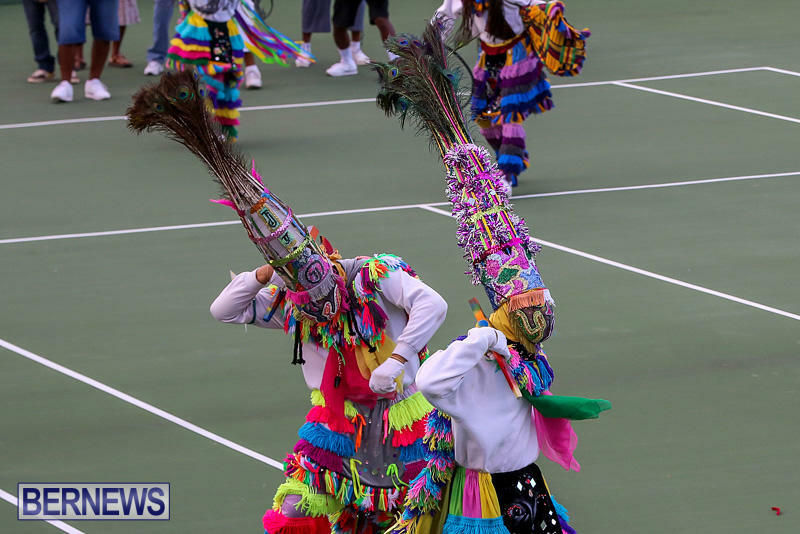 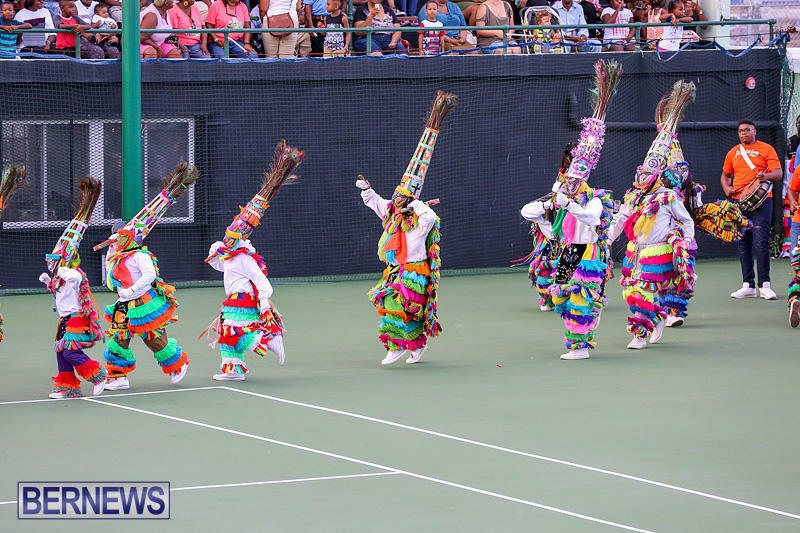 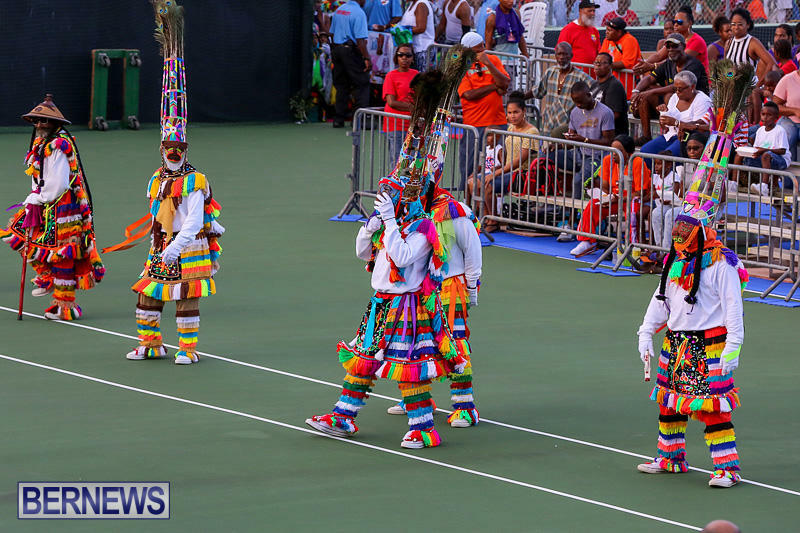 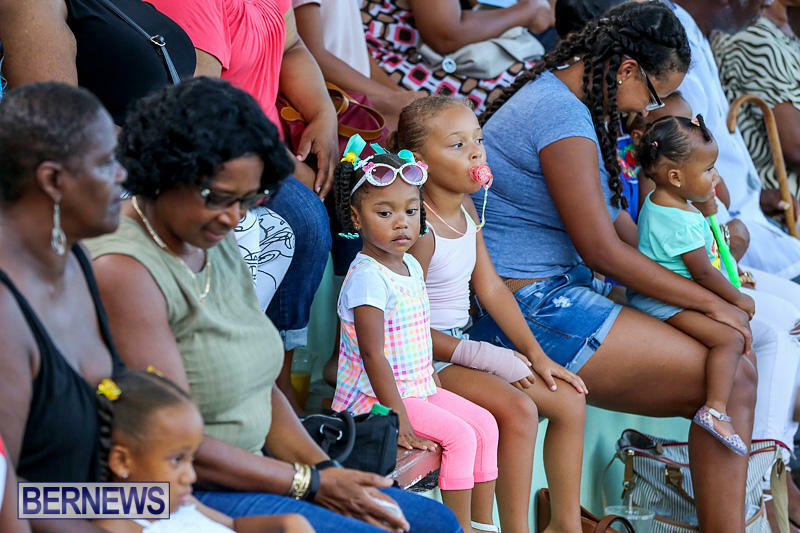 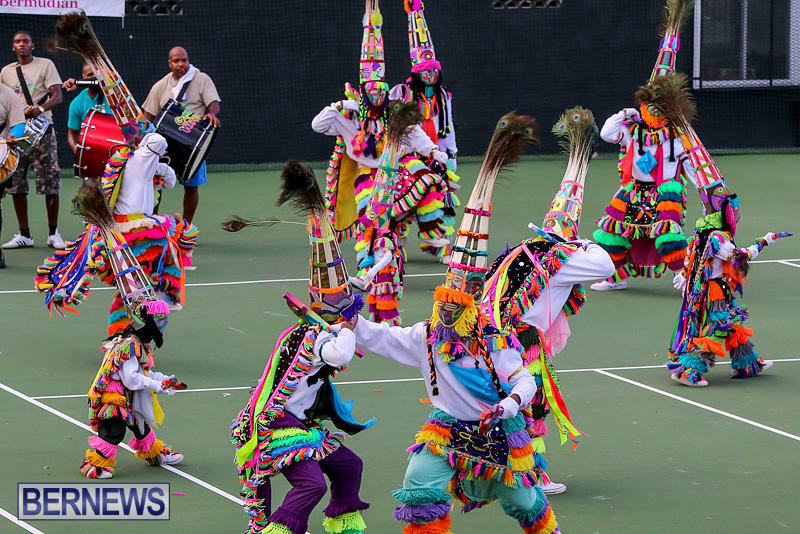 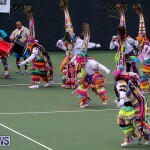 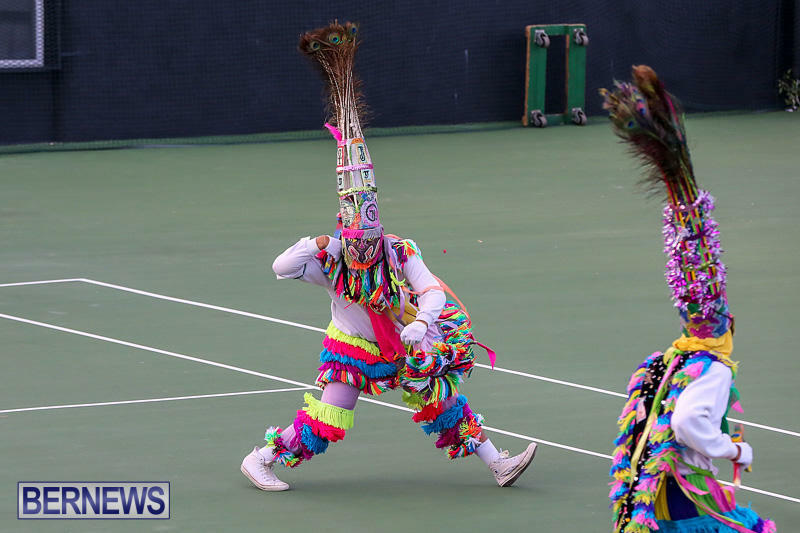 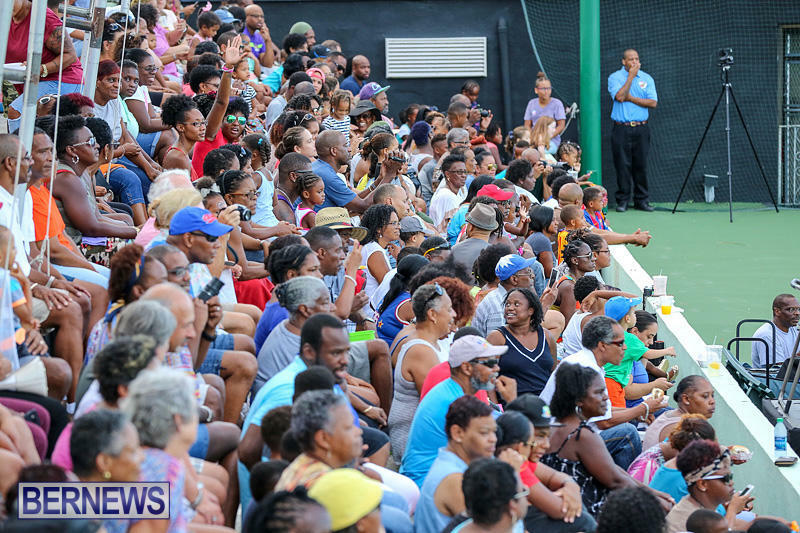 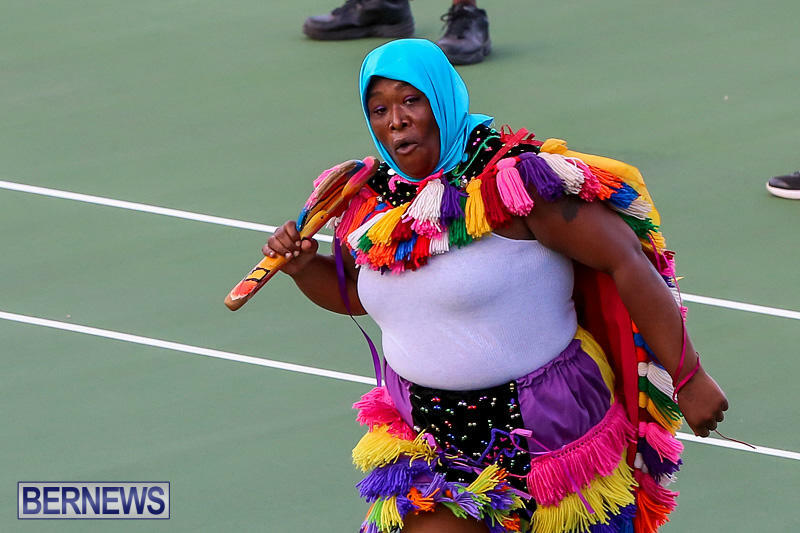 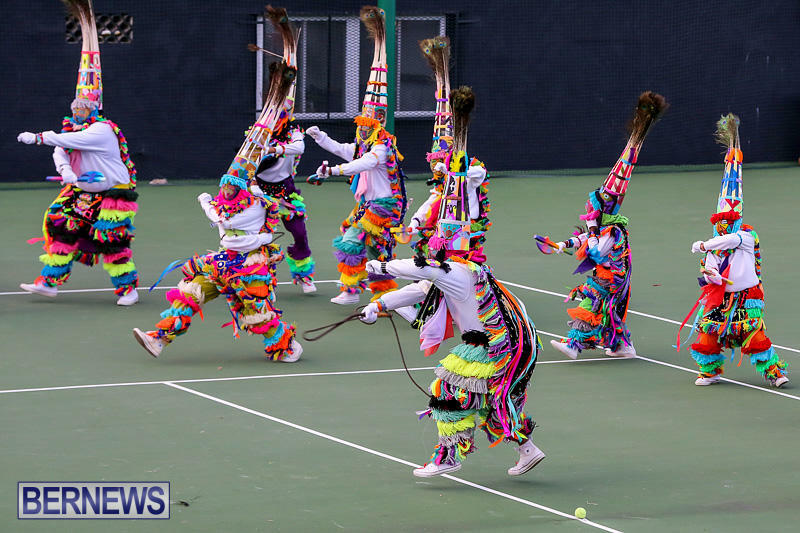 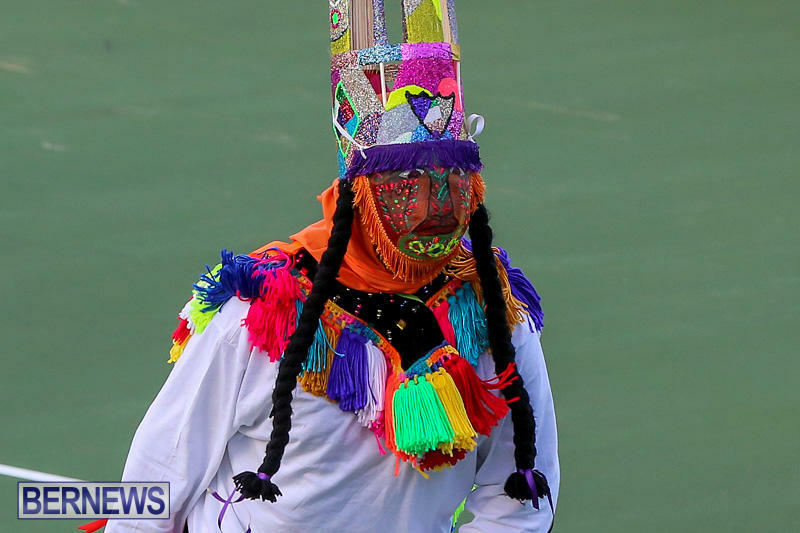 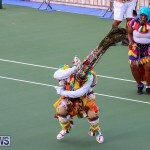 Crowds of people made their way to the tennis stadium this evening [Sept 10] as Bermudian culture was on full display at the 2016 Gombey Festival. 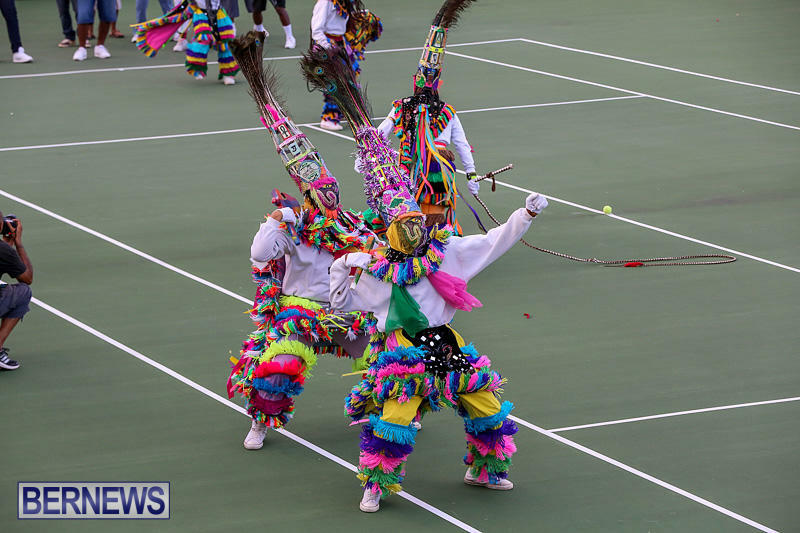 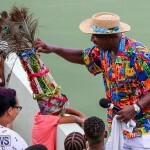 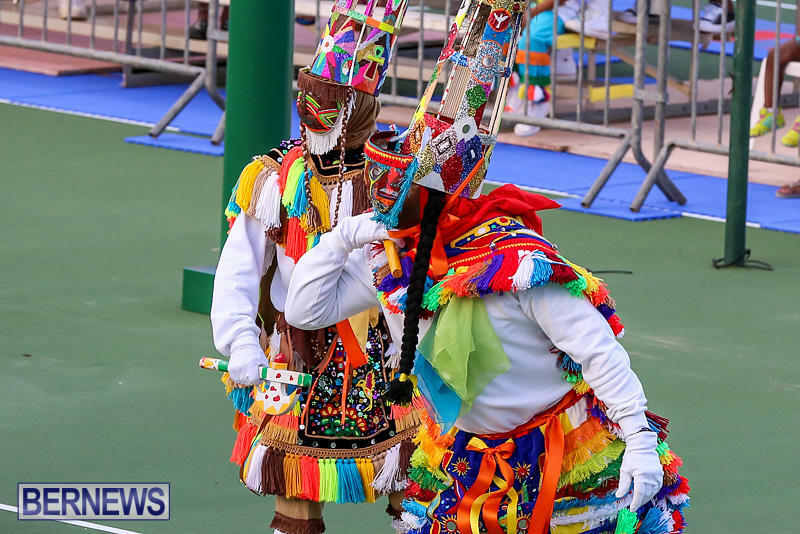 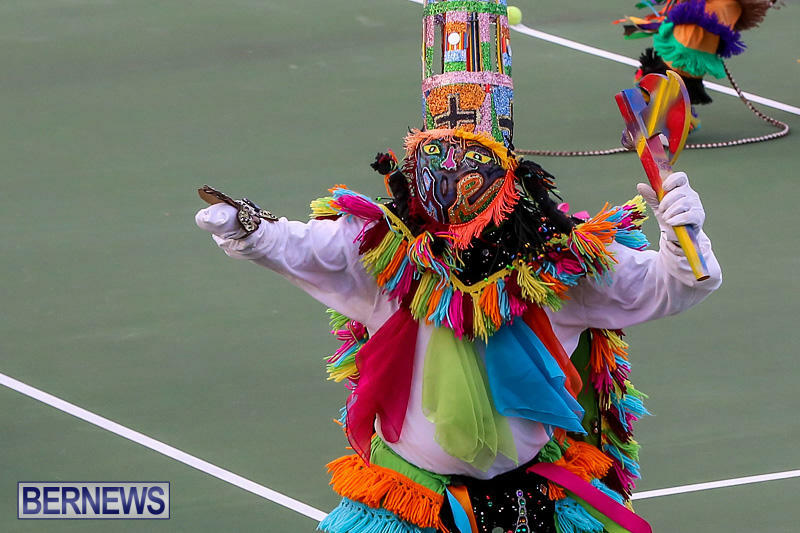 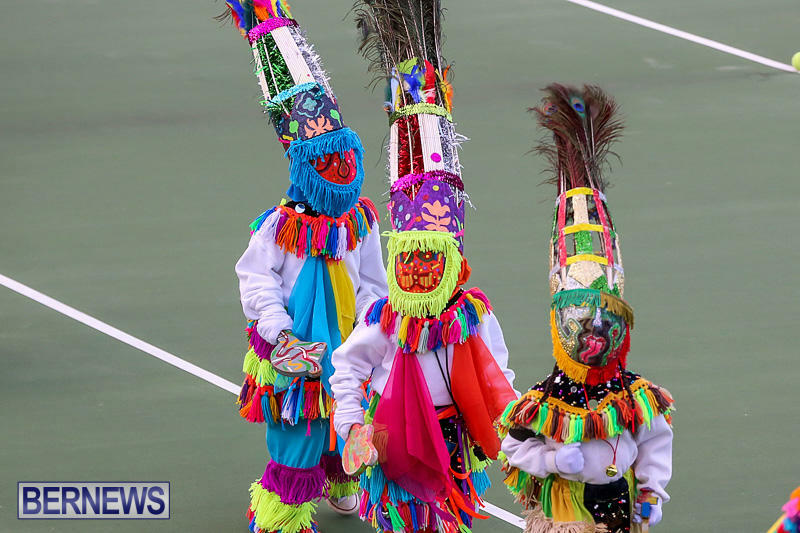 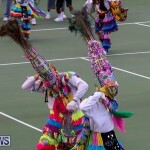 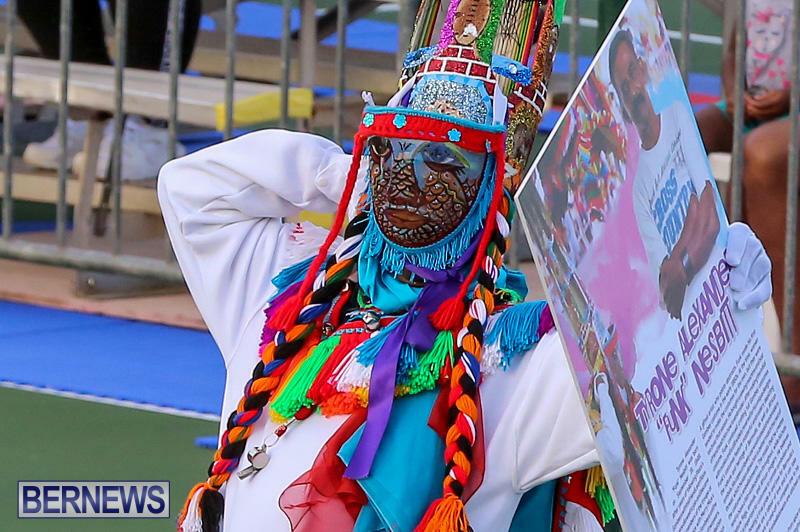 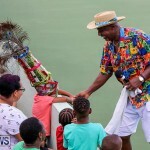 Hosted by the Department of Community and Cultural Affairs, the Gombey Festival is held annually to provide continued exposure to the folk art traditions of the iconic Bermuda Gombeys. 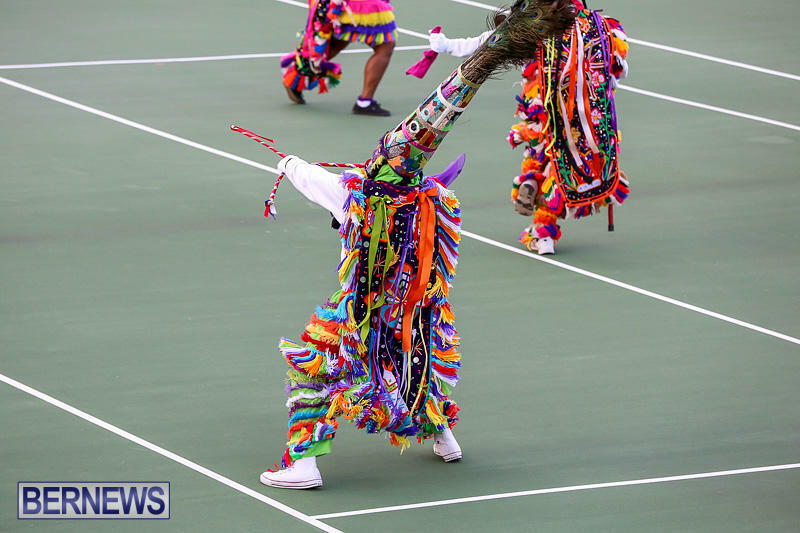 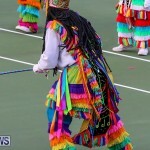 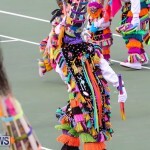 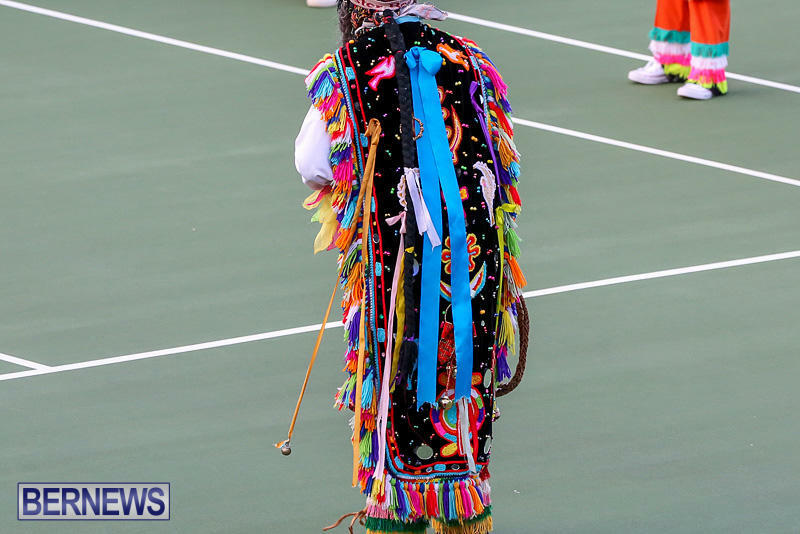 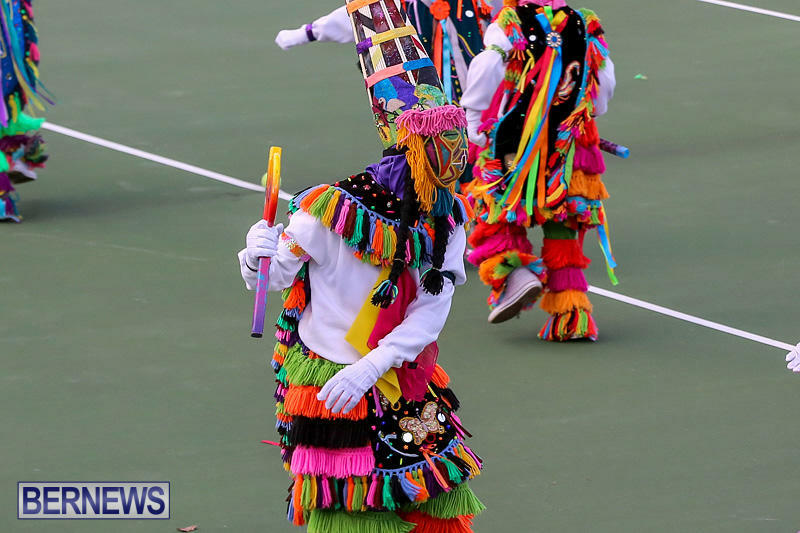 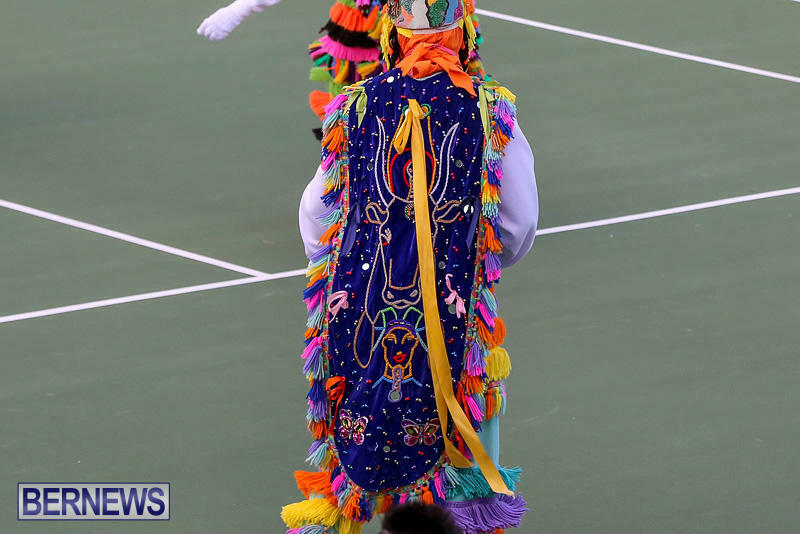 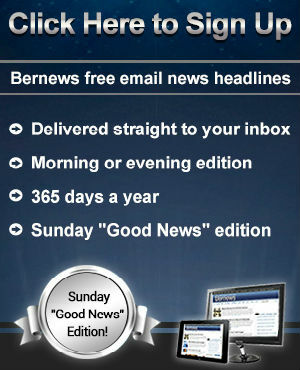 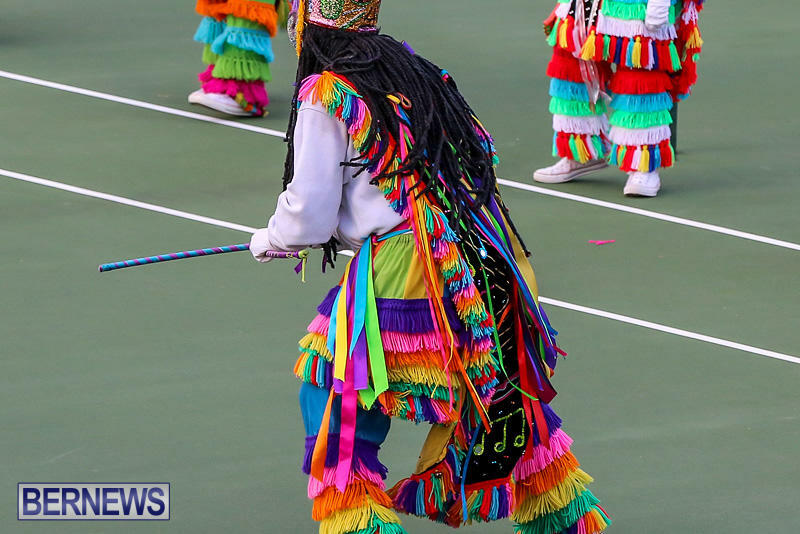 It includes performances from multiple troupes, serving to highlight a centuries old Bermudian tradition. 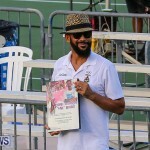 During the Festival, Tyrone “Funk” Nesbitt was recognized as this year’s honouree for his life’s contribution to the Gombey tradition. 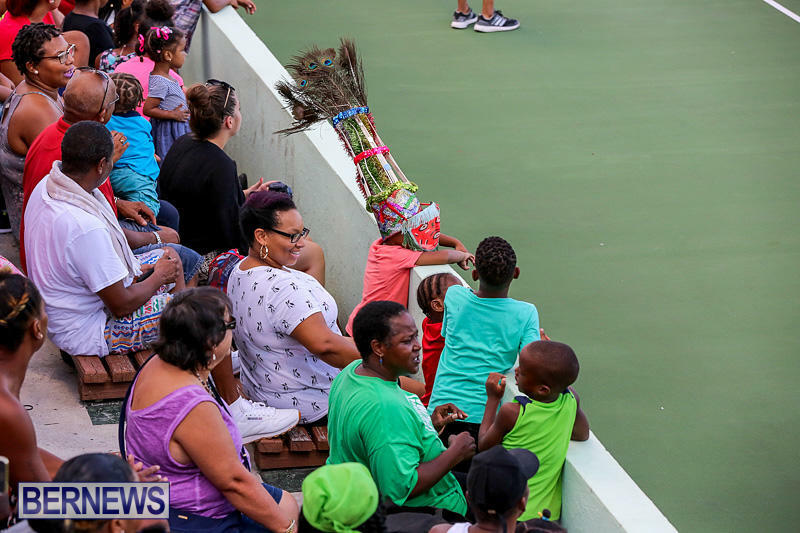 When asked to share his hopes for Gombeys going forward, Mr. Nesbitt said, “All I can say is that if Gombeys stick to tradition, it will go further. 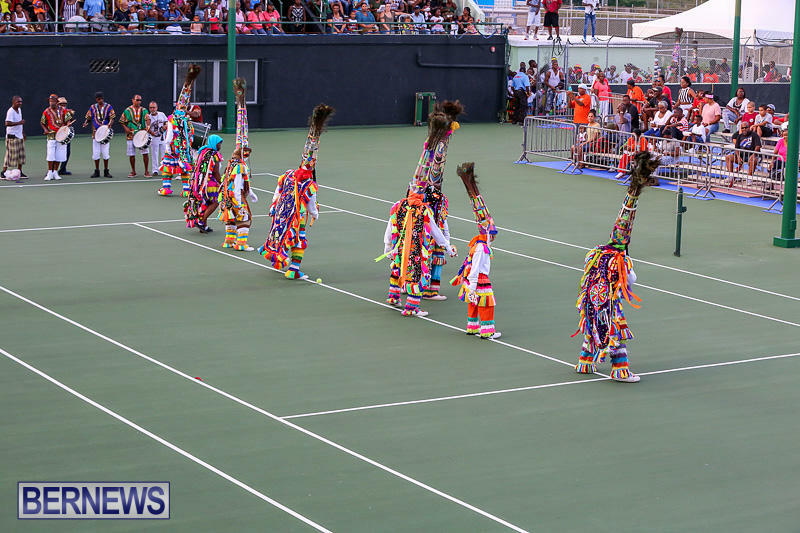 Some people try to exploit the culture, but it is important for us to remember the roots of where it comes from and to be an ambassador to Bermuda when performing. 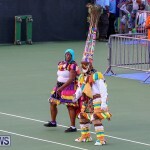 I follow them every time I hear them, which is a tradition for Africans. 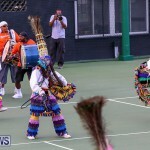 Just like during slavery, when de drums are sounded it is a built in GPS that triggers our awareness. 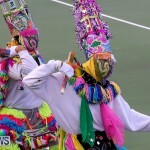 Shaun Kevin ,Andre and Dennis are just a few Captains I know, but you would only know who they are by their customs and their signature dance moves as their faces are hidden by their masks, which is also a tradition because they didn’t want to be identified by their salve masters to face punishment. 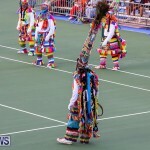 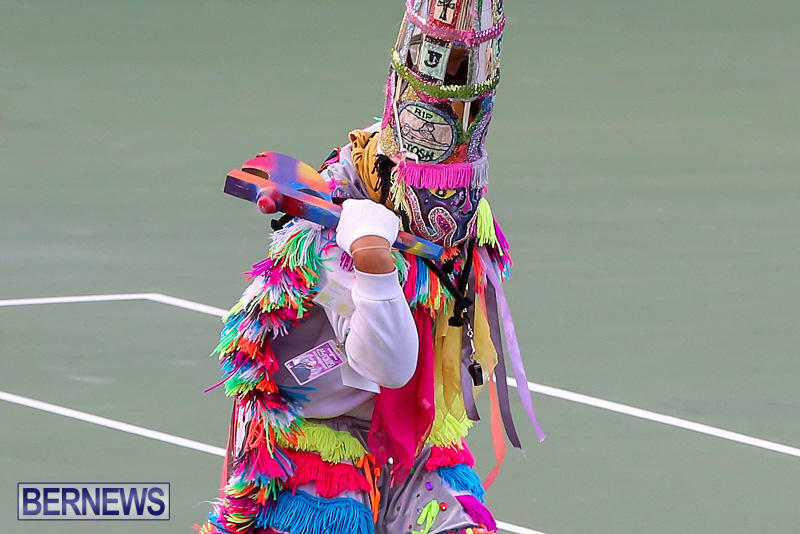 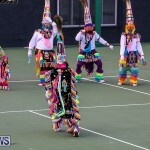 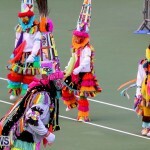 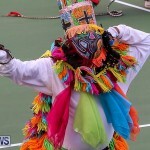 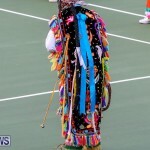 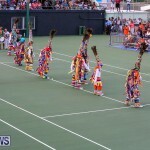 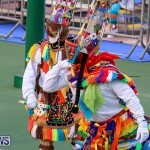 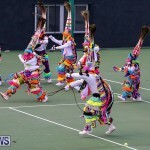 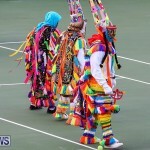 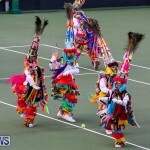 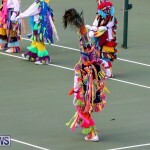 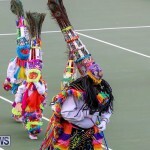 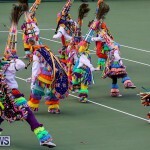 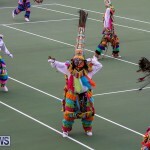 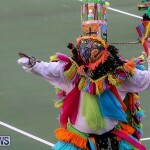 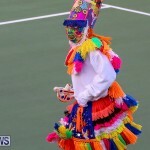 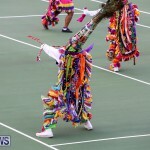 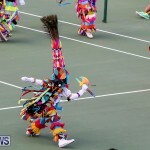 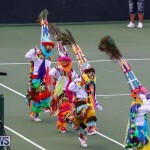 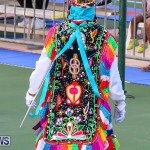 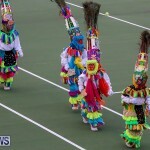 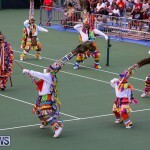 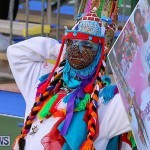 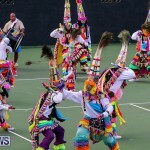 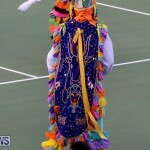 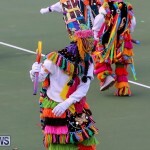 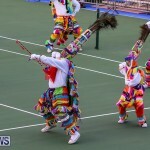 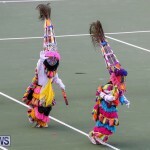 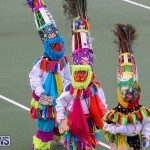 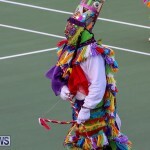 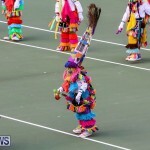 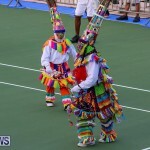 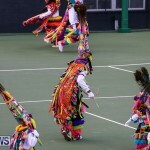 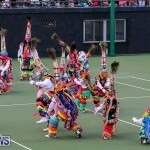 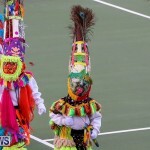 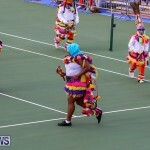 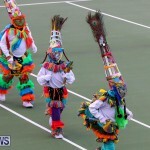 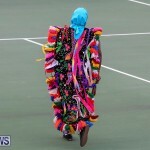 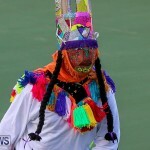 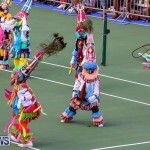 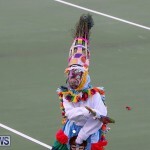 What do the Gombeys have to do with Bermuda. 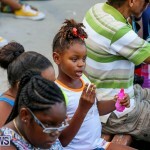 What part of history do they partake? 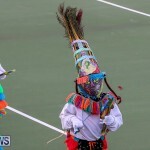 Why when a Gombey holds his hatchet up he holds it with the “blade” facing his own neck?